"Lambert Field" redirects here. For the former baseball stadium at Purdue University, see Lambert Field (Purdue University). St. Louis Lambert International Airport (IATA: STL, ICAO: KSTL, FAA LID: STL), formerly Lambert–St. Louis International Airport, is an international airport serving St. Louis, Missouri, United States. It is 14 miles (23 km) northwest of downtown St. Louis in unincorporated St. Louis County between Berkeley and Bridgeton. Commonly referred to as Lambert Field or simply Lambert, it is the largest and busiest airport in Missouri with over 259 peak daily departures to 74 nonstop domestic and international locations. In 2018, 15.6 million passengers traveled through the airport. The airport is a focus city for Southwest Airlines and serves as a hub for Air Choice One and Cape Air, and was formerly a hub for Ozark Air Lines, Trans World Airlines, and American Airlines. It is the largest U.S. airport classified as a medium-sized primary hub and currently the second busiest after Dallas–Love. Lambert covers 2,800 acres (1,133 ha) of land. St. Louis Lambert International Airport is the primary airport in the St. Louis area, with MidAmerica St. Louis Airport, about 37 miles (59 km) east, serving as a secondary metropolitan commercial airport. The two airports are connected by the Red Line of the city's light rail mass transit system, the MetroLink. Both airports are currently served by commercial passenger airlines. Named for Albert Bond Lambert, an Olympic medalist and prominent St. Louis aviator, the airport rose to international prominence in the 20th century thanks to its association with Charles Lindbergh, its groundbreaking air traffic control, its status as the primary hub of Trans World Airlines, and its iconic terminal. Designed by Minoru Yamasaki, the building inspired terminals at John F. Kennedy International Airport in New York City and Charles de Gaulle Airport in Paris, France. The airport originated as a balloon launching base called Kinloch Field, part of the 1890s Kinloch Park suburban development. The Wright brothers and their Exhibition Team visited the field while touring with their aircraft. During a visit to St. Louis, Theodore Roosevelt flew with pilot Arch Hoxsey on October 11, 1910, becoming the first U.S. president to fly. Later, Kinloch hosted the first experimental parachute jump. In June 1920, the Aero Club of St. Louis leased 170 acres of cornfield, the defunct Kinloch Racing Track and the Kinloch Airfield in October 1923, during The International Air Races. The field was officially dedicated as Lambert–St. Louis Flying Field in honor of Albert Bond Lambert, an Olympic silver medalist golfer in the 1904 Summer Games, president of Lambert Pharmaceutical Corporation (which made Listerine), and the first person to receive a pilot's license in St. Louis. In February 1925, "Major" (his 'rank' was given by the Aero Club and not the military) Lambert bought the field and added hangars and a passenger terminal. 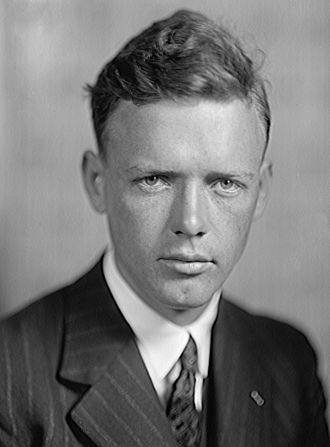 Charles Lindbergh's first piloting job was flying airmail for Robertson Aircraft Corporation from Lambert Field; he left the airport for New York about a week before his record-breaking flight to Paris in 1927. In February 1928, the City of St. Louis leased the airport for $1. Later that year, Lambert sold the airport to the City after a $2 million bond issue was passed, making it one of the first municipally-owned airport in the United States. In the late 1920s, Lambert Field became the first airport with an air traffic control system–albeit one that communicated with pilots via waving flags. The first controller was Archie League. In 1925, the airport became home to Naval Air Station St. Louis, a Naval Air Reserve facility that became an active-duty installation during World War II. 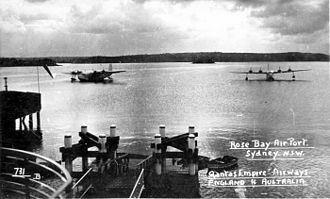 In 1930, the airport was officially christened Lambert–St. Louis Municipal Airport by Rear Admiral Richard E. Byrd. The first terminal building opened in 1933. 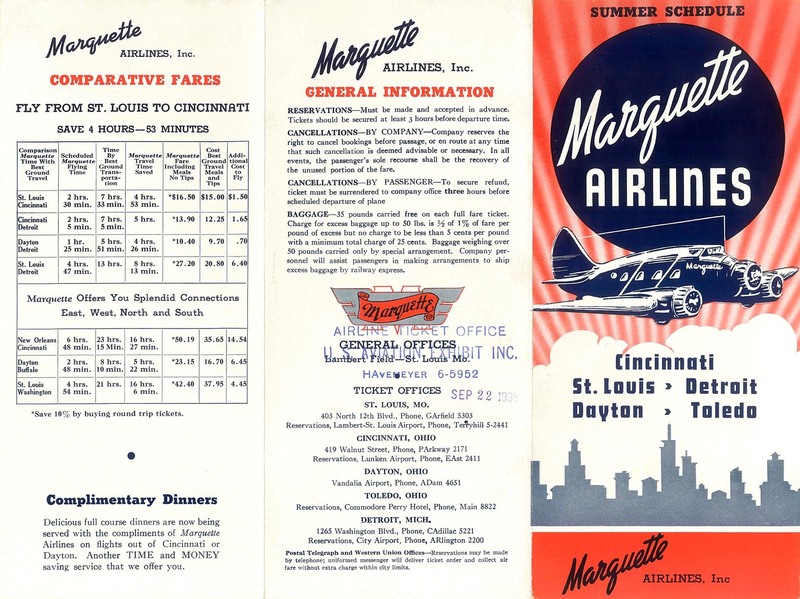 By the 1930s, Robertson Air Lines, Marquette Airlines and Eastern Air Lines provided passenger service to St. Louis, as did Trans World Airlines. In August 1942, voters passed a $4.5 million bond issue to expand the airport by 867 acres and build a new terminal. During World War II, the airport became a manufacturing base for McDonnell Aircraft and Curtiss-Wright. After the war, NAS St. Louis reverted to a reserve installation, supporting carrier-based fighters and land-based patrol aircraft. When it closed in 1958, most of its facilities were acquired by the Missouri Air National Guard and became Lambert Field Air National Guard Base. Some other facilities were retained by non-flying activities of the Naval Reserve and Marine Corps Reserve, while the rest was redeveloped to expand airline operations at the airport. Ozark Air Lines began operations at the airport in 1950. To handle increasing passenger traffic, Minoru Yamasaki was commissioned to design a new terminal, which began construction in 1953. Completed in 1956 at a total cost of $7.2 million, the three-domed design preceded terminals at John F. Kennedy International Airport in New York City and Paris–Charles de Gaulle Airport. A fourth dome was added in 1965 following the passage of a $200 million airport revenue bond. 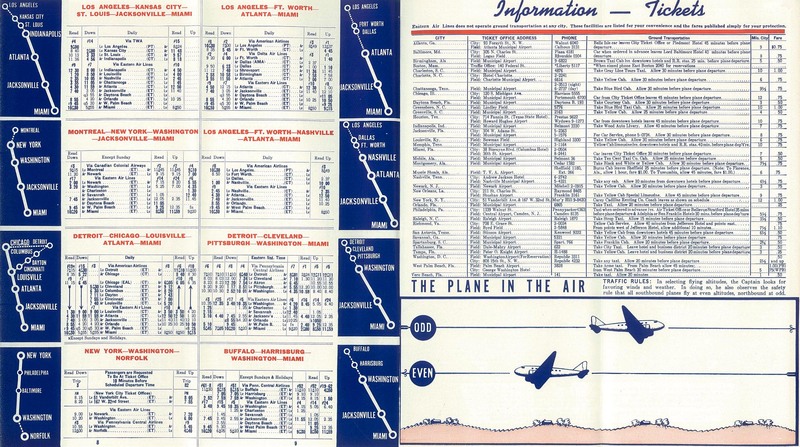 The April 1957 Official Airline Guide shows TWA with 44 weekday departures; American, 24; Delta, 16; Ozark, 14; Eastern, 13; Braniff, six and Central, two. The first jets were TWA 707s in July 1959. In 1971, the airport became Lambert–St. Louis International Airport. In the 1970s St. Louis city officials proposed to replace the airport with a new one in suburban Illinois. After Missouri residents objected in 1977, Lambert received a $290-million expansion that lengthened the runways, increased the number of gates to 81, and boosted its capacity by 50 percent. (A proposed Illinois airport was later built, though not near the originally proposed site; MidAmerica St. Louis Airport opened in 1997 in Mascoutah, Illinois. As of 2018 the only scheduled passenger service is by Allegiant Air.) Concourse A and Concourse C were rebuilt into bi-level structures with jet bridges as part of a $25 million project in the mid-1970s designed by Sverdrup. The other concourses were demolished. Construction began in the spring of 1976 and was completed in September 1977. A $20 million, 120,000-square-foot (11,000 m2) extension of Concourse C for TWA and a $46 million, 210,000-square-foot (20,000 m2) Concourse D for Ozark Airlines also designed by Sverdrup were completed in December 1982. Ozark Airlines established its only hub at Lambert in the late 1950s. The airline grew rapidly, going from 36 million revenue passenger miles in 1955, to 229 million revenue passenger miles in 1965. The jet age came to Ozark in 1966 with the Douglas DC-9-10 and its network expanded to Denver, Indianapolis, Louisville, Washington, D.C., New York City, Miami, Tampa and Orlando. With the addition of jets, Ozark began its fastest period of growth, jumping to 653 million revenue passenger miles by 1970 and 936 million revenue passenger miles by 1975; Ozark soon faced heavy competition in TWA's new hub at Lambert. 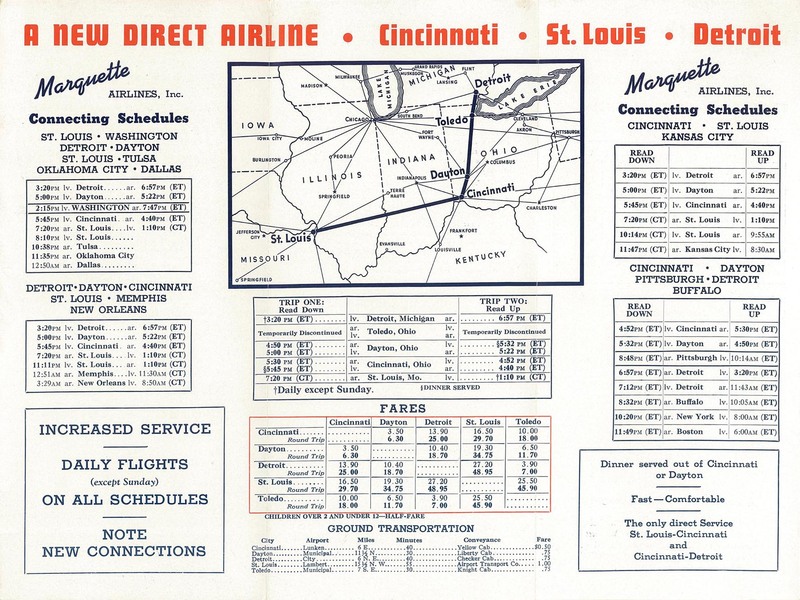 By 1979, the year after airline deregulation, STL's dominant carriers were TWA (36 routes) and Ozark (25), followed by American (17) and Eastern (12). Other carriers at STL included Air Illinois, Air Indiana, Braniff, Britt, Brower, Delta, Frontier, Northwest Orient, Republic, Texas International, Trans-Mo and USAir. After airline deregulation in 1978, airlines began to realign their operations around a hub and spoke model. Trans World Airlines (TWA) was headquartered in New York City but its main base of employment was at Kansas City International Airport and had large operations at Chicago O'Hare International Airport as well as St. Louis. TWA deemed Kansas City terminals as unsuitable to serve as a primary hub. TWA reluctantly ruled out Chicago, as its Chicago operation was already losing $25 million a year under competition from American Airlines and United Airlines. This meant that St. Louis was the carrier's only viable option. TWA proceeded to downsize Chicago and build up St. Louis, swapping three Chicago gates for five of American's St. Louis gates. By December 1982, St. Louis accounted for 20% of TWA's domestic capacity. Lambert's terminal was initially too small for this operation, and TWA was forced to use temporary terminals, mobile lounges and airstairs to handle the additional flights. After Concourse D was completed in 1985, TWA began transatlantic service from Lambert to London, Frankfurt and Paris. TWA's hub grew again in 1986 when the airline bought Ozark Airlines, which operated its hub from Lambert's B, C, and D concourses. In 1985, TWA had accounted for 56.6% of boardings at STL while Ozark accounted for 26.3%, so the merged carriers controlled over 80% of the traffic. As of 1986, TWA served STL with nonstop service to 84 cities, an increase from 80 cities served by TWA and/or Ozark in 1985, before the merger. Despite the entry of Southwest Airlines in the market in 1985, the TWA buyout of Ozark and subsequent increase in the nonstop cities served, the number of passengers using Lambert held steady from 1985 through 1993, ranging between 19 million and 21 million passengers per year throughout the period. Lambert again grew in importance for TWA after the airline declared bankruptcy in 1992 and moved its headquarters to St. Louis from Mount Kisco, NY in 1993. TWA increased the number of cities served and started routing more connecting passengers through its hub at Lambert: the total number of passengers using Lambert rose from 19.9 million passengers enplaned in 1993 to 23.4 million in 1994, jumping almost 20% in one year. Growth continued, with total enplaned passengers jumping to 27.3 million by 1997 and 30.6 million in 2000, the highest level in its history. By the late 1990s, Lambert was TWA's dominant hub, with 515 daily flights to 104 cities as of September 1999. Of those 515 flights, 352 were on TWA mainline aircraft and 163 were Trans World Express flights operated by its commuter airline partners. During this period, Lambert Field was ranked as the eighth-busiest U.S. airport by flights (not by total passengers), largely due to TWA's hub operations, Southwest Airlines' growing traffic, and commuter traffic to smaller cities in the region. Congestion caused delays during peak hours and was exacerbated when bad weather reduced the number of usable runways from three to one. To cope, Lambert officials briefly redesignated the taxiway immediately north of runway 12L–30R as runway 13–31 and used it for commuter and general aviation traffic. Traffic projections made in the 1980s and 1990s predicted yet more growth, however: enough to strain the airport and the national air traffic system. These factors led to the planning and construction of a 9,000-foot runway, dubbed Runway 11/29, parallel to the two larger existing runways. At $1.1 billion, it was the costliest public works program in St. Louis history. It required moving seven major roads and destroying about 2,000 homes, six churches, and four schools in Bridgeton. Work began in 1998 and continued even as traffic at the airport declined after the 9/11 attacks, the collapse of TWA and its subsequent purchase by American, and American's flight reductions several years later. As of 2018, the runway is used for approximately 12% of all takeoffs and landings. As TWA entered the new millennium, its financial condition proved too precarious to continue alone and in January 2001, American Airlines announced it was buying TWA, which was completed in April of that year. The last day of operations for TWA was December 1, 2001, including a ceremonial last flight to TWA's original and historic hometown of Kansas City before returning to St. Louis one final time. The following day, TWA was officially absorbed into American Airlines. The plan for Lambert was to become a reliever hub for the existing American hubs at Chicago–O'Hare and Dallas/Fort Worth. American was looking at something strategic with its new St. Louis hub to potentially offload some of the pressure on O'Hare as well as provide a significant boost to the airline's east/west connectivity. The September 11, 2001 terrorist attacks were a huge demand shock to air service nationwide, with total airline industry domestic revenue passenger miles dropping 20% in October 2001 and 17% in November 2001. Overnight, American no longer had the same need for a hub that bypassed its hubs at Chicago and Dallas, which suddenly became less congested. As a result of this and the ongoing economic recession, service at Lambert was subsequently reduced over the course of the next few years; to 207 flights by November 2003. Total passenger traffic dropped to 20.4 million that same year. On the international front, flights to Paris went to seasonal in December 2001 and transatlantic service was soon discontinued altogether when American dropped flights to London in late 2003. In 2006, the United States Air Force announced plans to turn the 131st Fighter Wing of the Missouri Air National Guard into the 131st Bomb Wing. The wing's 20 F-15C and F-15D aircraft were moved to the Montana Air National Guard's 120th Airlift Wing at Great Falls International Airport/Air National Guard Base, Montana and the Hawaii Air National Guard's 154th Wing at Hickam AFB, Hawaii. The pilots and maintainers moved to Whiteman AFB, Missouri to fly and maintain the B-2 Spirit stealth bomber as the first Air National Guard wing to fly the aircraft. Lambert Field Air National Guard Base formally shut down on June 13, 2009 when the final two F-15C Eagles did a low approach over the field and then flew away, ending an 86-year chapter of Lambert's history. 2006 also saw the completion of the W-1W airport expansion after 8 years of work. The culmination of this program was the opening of Runway 11/29, the airport's fourth, on April 13, 2006 when American Airlines Flight 2470 became the first commercial airliner to land on the new runway. In 2007, airport officials announced the largest renovation in the airport's history: a $70 million effort to overhaul Terminal 1 called "The Airport Experience Project." Planned renovations included updating and modernizing the interior, redesigning signage, and modernizing the baggage system. The first phase of the project began in 2008, with the replacement of signage in order to improve navigation inside the terminal, replacement of the baggage handling system, and renovation of the domed vaults of the ticketing hall. Bonds were issued in 2009 to assist with funding. In 2008, Lambert's position as an American Airlines hub faced further pressure due to increased fuel costs and softened demand because of a depressed economy. American cut its overall system capacity by over 5% during 2008. At Lambert, American shifted more flights from mainline to regional. Total passengers enplaned fell 6% to 14.4 million in 2008, then fell another 11% to 12.8 million passengers in 2009. In September 2009, American Airlines announced that as a part of the airline's restructuring, it would eliminate its St. Louis hub by reducing its operations from approximately 200 daily flights to 36 daily flights to nine destinations in the summer of 2010. These cuts ended the remaining hub operation. American's closure of the St. Louis hub coincided with its new "Cornerstone" plan, wherein the airline would concentrate itself in several major markets: Chicago, Dallas/Fort Worth, Miami, New York, and Los Angeles. In early October 2009, Southwest Airlines announced the addition of 6 daily flights to several cities as an immediate response to the cutbacks announced by American Airlines. Then on October 21, 2009, Southwest announced that it would increase service with a "major expansion" in St. Louis by May 2010. The airline announced it would begin flying nonstop from St. Louis to 6 new cities for a new total of 31 destinations, increasing the number of daily departures from 74 to 83. This had the effect of replacing American as the carrier with the most daily flights after American's service cuts in summer 2010. The airport hit its nadir in 2010 following the closure of the American hub in the midst of the Great Recession, ending the year with the lowest passenger and airplane movement statistics of any modern year on record. Fortunately for the airport, Southwest's announced expansion at Lambert immediately began to fill in for many of the holes left by the demise of the hub. What followed were several years of steady growth by Southwest that maintained passenger numbers at a fairly steady level, allowing airport leadership time to shift priorities and begin the long road to recovery in earnest. Complicating recovery was the 'Good Friday tornado'. At about 8:10 p.m. on April 22, 2011, an EF4 tornado struck the airport's Terminal 1, destroying jetways and breaking more than half of the windows. One plane from Southwest Airlines was damaged when the wind pushed a baggage conveyor belt into it. Four American Airlines planes were damaged, including one that was buffeted by 80 mph crosswinds while taxiing after landing. Another aircraft, with passengers still aboard, was moved away from its jetway by the storm. The FAA closed the airport at 08:54 pm CDT, then reopened it the following day at temporarily lower capacity. The damage to Concourse C even forced several airlines to use vacant gates in the B and D concourses. The TSA would later declare Lambert Airport its "Airport of the Year" for "exceptional courtesy [and] high-quality security" as well as the "excellent response by airport officials during and after the tornado". In the meantime, the tornado and subsequent damage to the terminal facilities accelerated the timeline for the "Airport Experience Program", a large-scale renovation of the interior spaces of Terminal 1 and its concourses. Concourse C underwent renovations and repairs and finally reopened on April 2, 2012. One of the first true indications of the airport's recovery was in May 2013, when several credit agencies improved their evaluations of the airport's finances. Moody's raised its rating on Lambert Airport's bonds to A3 with a stable outlook from Baa1 with a stable outlook. Standard & Poor's (S&P) raised its rating to A- with a stable outlook from A- with a negative outlook. This was the first time in more than a decade that both Moody's and Standard & Poor's ratings for the Airport had both been in the single "A" category. Earlier in the month, Fitch Ratings upgraded outstanding airport revenue bonds to 'BBB+' from 'BBB' with a stable outlook. The rating agencies attributed the upgrades to strong fiscal management and positive passenger traffic. In 2015, the airport released a new Five Year Strategic Plan. The overall mission statement of the airport was given as "connecting [the St. Louis] region with the world", while also detailed were four major strategic objectives: Strengthening Financial Sustainability; Sustaining and Growing Passenger Air Service; Creating a Positive and Lasting Impression for the Region; and Generating Economic Development. The plan went into detail regarding each objective, listing overall measures of success and potential methods to attain successful outcomes. Some of the given measures of success are reducing costs per enplaned passenger, reducing the airport's debt service, maximizing sources of revenue (primarily non-aviation), increasing passenger throughput, gaining new passenger services, improving satisfaction survey scores, and increasing revenue from cargo. In January 2016, the airport completed renovations of Terminal 1, concluding more than seven years of planning and renovation work throughout the airport. In late 2016, the City of St. Louis announced it would either keep the name Lambert–St. Louis International Airport or change it to St. Louis International Airport at Lambert Field. This effort to re-brand was brought about to further freshen up the airport's image and also to emphasize the importance of 'St. Louis' in the name, as research carried out at the behest of the city government had found that the current name had the potential to confuse travelers. The decision was not without controversy, however: descendants of Albert Bond Lambert opposed moving 'Lambert' to the end of the name as they argued it de-emphasized the importance of Maj. Lambert to both the airport's history and the history of aviation in general. Thus, the proposal was amended, and the St. Louis Airport Commission voted unanimously to change the name of the airport to St. Louis Lambert International Airport on September 7, 2016. The proposal thereafter gained the approval of the city's Board of Estimate and Apportionment. On October 14, 2016, the St. Louis Board of Aldermen approved the name change, and on October 25, St. Louis mayor Francis Slay signed the bill approving the name change. After going through the formal process to submit the name change to the Federal Aviation Administration, the airport debuted new branding and a completely redesigned website on February 14, 2017, signaling the start of a new era in the airport's history. In early 2017, Lambert began to renovate four unused gates in Concourse D and renamed them as E gates. This work was undertaken to accommodate the continued growth of Southwest Airlines at Lambert's Terminal 2 and was finished in time for the summer flying season. In May 2017, Moody's again raised its rating of Lambert's bonds and debt to A3 with a positive outlook from A3 with a stable outlook, primarily due to continued growth in enplanements, declining debt, and no major capital expenditures. By the same token, S&P issued an A- long-term rating with a positive outlook, up from A- with a stable outlook, citing "favorably declining debt levels and strong liquidity [as well as] stable passenger enplanement levels and a good competitive position that supports a good base of air travel demand". Later in the year, Fitch also raised their bond outlook to A- with a stable outlook from BBB+ with a positive outlook, citing many of the same reasons as the other two agencies. An August 21, 2017 FAA Press Release announced that Lambert was one of 67 airports selected to receive infrastructure grants from the U.S. DOT. The airport was granted $7.1 million for "Realignment and Reconstruction of Taxiway Kilo; Reconstruction of Taxiway Sierra from Taxiway Echo to Runway 12R-30L; Widening of Taxiway Kilo Fillet from Runway 12R-30L to Taxiway Delta; and Rehabilitation and Reconstruction of Runway 12L-30R Outer Panels and Replacement of Electrical Circuits". On August 23, 2017, WOW air announced that in 2018 they would commence four weekly A321 flights between St. Louis and Reykjavík, Iceland as part of a planned multi-city U.S. expansion. As part of the service agreement, the Airport and St. Louis County Port Authority will combine for approximately $800,000 in incentives to market the route and will waive landing fees for WOW air for 18 months, while WOW air guaranteed the route will remain for at least two years. Due to strong sales, WOW added a fifth weekly flight in January 2018. The first flight from Reykjavík landed on May 17, 2018, becoming the first regularly scheduled commercial flight between St. Louis and any part of Europe since American Airlines discontinued European service in 2003. However, just five months later on October 15, WOW air announced that it would be ending the route, with the last flight planned on January 7, 2019. The announcement blindsided airport officials, who had been told that St. Louis was one of the airline's top-performing Midwestern markets not long before the cancellation and were under the impression that the airline was satisfied with the route's performance. As it turned out, St. Louis was just the first of several announced cancellations of new U.S. destinations by WOW, possibly due to ongoing financial difficulties at the burgeoning airline. Due to the cancellation, WOW will not meet the criteria to receive any of the offered marketing incentives, though it is unclear whether or not the airline will have to repay the waived landing fees. On October 30, 2017, American Airlines announced that it would close its St. Louis pilot base in September 2018, affecting 153 pilots and several administrative staff. American cited the retirement of older aircraft and network planning as the primary reasons for the shutdown. The move is not expected to affect services to the airport, but signals the end of one of the final remnants of TWA's legacy at Lambert. In March 2018, the airport announced that STL Fuel Company LLC, the consortium that manages fuel services at the airport, had been cleared to construct a new $50 million fuel storage facility on the northeastern part of the airport property. The new facility will have three 722,000 gallon storage tanks initially, though there will be room for expansion. The current facility, located across from Terminal 1, was one of the first below-ground integrated aircraft fueling hydrant systems in the country when it began operations in 1957; its age and new environmental regulations are the catalyst for the move. Once the new facility is complete, the current facility will be demolished and the environmental conditions around it remediated at the consortium's expense. Preliminary work is already underway, including upgrades to the existing terminal fuel lines. On June 25, 2018, the airport tweeted that there would be a press conference the following day to announce the commencement of service by a new airline. This was revealed in the scheduled press conference to be Sun Country Airlines with seasonal flights to Fort Myers and Tampa beginning later in 2018. On January 8, 2019, Sun Country would announce an expansion of services from Lambert, including two new destinations in Portland and Minneapolis, both slated to begin on June 7, 2019. On July 16, 2018, the U.S. DOT announced an additional grant of $10.2 million for Lambert as part of the "Airport Improvement Program" in order to facilitate repairs to runway 12L/30R and "associated airfield guidance signs and runway lighting". A TSA press release on July 30, 2018 indicated that Lambert would be one of the first 15 airports in the country to receive one of its new 'computed tomography scanners' for testing purposes. This technology creates fully three-dimensional scans of items and enhances explosive-detecting methodology, and has to potential to significantly speed up the security screening process. The equipment was installed by the end of 2018. In August 2018, Moody's raised its rating of Lambert's bonds yet again, this time from A3 with a positive outlook to A2 with a stable outlook. The company stated that the airport's debt service "will improve incrementally over the near term with STL’s declining cost structure and positive enplanement trend driving increasingly competitive cost per enplanement (CPE)" and also cited "rapid growth in connecting enplanements, new routes and increased flight frequencies and growth in passenger seats to the market" as further factors leading to the upgrade. Following Moody's announcement, S&P affirmed the airport's bond rating as A- with a stable outlook. In October 2018, Fitch also upgraded its rating of the airport's bonds, this time to A- with a positive outlook, up from stable. Fitch stated that the upgrade "reflects an expanding enplanement base, stable cash flow, and declining leverage at STL." On August 31, 2018, the City of St. Louis issued an RFQ for "Terminal 2 Baggage Carousel Expansion". With a total estimated cost of $23.3 million, of which $16.2 million would be paid for by Southwest, the project aims to add a 10,500 square-foot addition to the Terminal 2 structure, add a third baggage carousel, replace the existing baggage carousels, and provide for the replacement or addition of all needed building utilities, signage, and systems, including luggage belts and a new bag transfer facility. Also being considered is a move of the current curbside baggage check-in location from the north end to the south end of the departure drop-off area. The project is awaiting approval from the city's Board of Aldermen and Board of Estimate and Apportionment. An ongoing dispute is a potential privatization of the airport. This initiative was started in 2017 by St. Louis mayor Francis Slay shortly before leaving office. Slay traveled to Washington, D.C. in March of that year to submit a preliminary application with the FAA to explore privatization, with the hope that Lambert would be selected for one of five open slots in the FAA’s "Airport Privatization Pilot Program". The primary reason cited for the effort is for extra capital to be funneled into the city's coffers as part of a lease with a private airport operator, as the current arrangement provides approximately $6 million in revenue annually to the city and limits what that money may be spent on. On April 24, 2017, the FAA accepted the preliminary application, allowing the city to fully explore the possibility of privatizing the airport. As of December 2018[update], Southwest Airlines is the dominant carrier at Lambert, accounting for nearly 62% of passengers over the previous 12-month time period. American Airlines is a solid second, at just over 10.6%, while Delta Air Lines is third at 7.5%. The airport's current ~156-foot (~47.6-meter) control tower opened in 1997 at a cost of approximately $15 million. The airport has four runways, three of which are parallel with one crosswind. The crosswind runway, 6/24, is the shortest of the four at 7,607 feet (2,319 m). The newest runway is 11/29, completed in 2006 as part of a large expansion program. The airport has two terminals with a total of 5 concourses. International flights and passengers use Terminal 2, whose lower level holds the customs facilities. 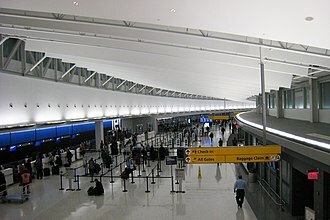 It was possible to walk between the terminals via Concourse D until the connection was blocked in 2008 with the closure of Concourse D.
Terminal 1 opened in 1956 along with several single story concourses. The terminal itself would be expanded in the 1960s, while Concourses A and C were rebuilt as two story buildings with jetbridges in the early 1970s. Expansion by both Ozark Airlines and TWA forced the construction of Concourse D in the early 1980s. Up until its demise, TWA operated an enormous domestic hub out of Terminal 1. From 2008 to 2016, Lambert comprehensively renovated Terminal 1, which came to include considerable repairs following a tornado that struck the airport in 2011. The terminal features an American Airlines Admirals Club and one of the largest USO facilities in the nation. Vacant; currently only used as a rental event space. Terminal 2 opened in 1998 and was built in order to accommodate the growing presence of Southwest in the St. Louis market. As Southwest has continued to expand in St. Louis, former unused gates in the D concourse have been renovated and renamed as E gates. As of 2018, there are 18 active gates. In January 2018, a new common-use lounge, operated by Wingtips, opened near gate E31. This lounge is the first in Terminal 2 and the only common-use club in the airport. Lambert's runways have long been used for test flights and deliveries of military aircraft, first by McDonnell Douglas, which built its world headquarters and principal assembly plant next to the airport, and now by Boeing, which bought McDonnell and currently uses its St. Louis facilities as the primary manufacturing facility for its Defense, Space & Security division. Until 2016, Boeing Defense, Space & Security was also headquartered in St. Louis; that year, it was moved to the Washington, D.C. area, affecting approximately 12 executive positions and their support staff. The company cited easier access to potential customers as the reason for the move. The plant currently builds the F-15 Strike Eagle, F/A-18 Super Hornet, and EA-18 Growler. It was formerly home to Boeing Phantom Works until Boeing moved the division's headquarters to Seattle in September 1999, though it does still maintain a significant presence at the airport. In more recent developments, the first two prototypes of the Boeing T-X trainer, Boeing and Saab Group's joint entry for the T-X program to replace the aging Northrop T-38 Talon, were constructed at Boeing's Lambert facilities. The first prototype underwent its first test flight in December 2016. On May 15, 2017, Boeing announced that St. Louis would be the assembly location for the T-X should they win the USAF contract. Moreover, it was reported in early 2018 that there was a likelihood that should Boeing's design for the MQ-25 carrier-based refueling drone be selected for purchase by the United States Navy, it would be built at Boeing's St. Louis facilities. This was confirmed on August 30, 2018, when Boeing's design was selected by the Department of Defense and Boeing was awarded a contract for four examples to be produced by 2024, with 45.5% of the work to be done at Boeing's St. Louis facilities. Up to 72 examples may be purchased by the Navy, totaling $7 billion in sales. The selection was viewed as a much-needed win by both the region and the company. On September 27, 2018, Boeing/Saab's joint entry for the T-X Program was announced as the contract winner of the T-X program, beating out competing entries from Lockheed/KAI and Leonardo and capping off a month of success for Boeing as it captured three major defense contracts. The initial contract is for 351 aircraft, 46 simulators, and associated ground equipment worth $9.2 billion, though the contract allows the Air Force to purchase up to 475 aircraft and 120 simulators. Overall, the Air Force predicts it may spend upwards of $16 billion on new trainer aircraft. It is also possible that more aircraft and support services will be purchased by foreign customers, meaning the program as a whole will likely be rather lucrative. The aircraft will be built at Boeing's St. Louis facility, ensuring Boeing's tactical aircraft business remains strong as F-15 and F/A-18 production begins to wind down, and was viewed as a "critical" win by both Boeing and regional leaders. In October 2018, it was announced that neither of Boeing's two competitors would protest the decision, fully clearing the way for the program to commence. In addition, Saab will also build a U.S. manufacturing facility to complete its allocated work on each aircraft. On December 20, 2018, the US Naval Air Systems Command awarded Boeing an additional $90.4 contract for "studies and analysis related to the MQ-25". On March 20, 2019, Boeing was awarded a $4 billion contract to produce 78 F/A-18 Super Hornets for the U.S. Navy by April 2024. Approximately 9% of the work will be done in St. Louis. Ozark Air Lines had its corporate headquarters on airport property before it was purchased by TWA. The building is now headquarters for Trans States Holdings. Airport Terminal Services Inc. maintains facilities at Lambert and is headquartered in St. Louis. Announced in February 2007, "The Airport Experience Project" was designed to update and modernize many facets of Terminal 1. It was set back somewhat by the 2011 tornado damage, but was completed by January 2016 at a total cost of nearly $150 million. The domed ceiling was completely restored with a new acoustic coating and a programmable LED lighting system. A faster, quieter baggage carousel system was installed. The Main and East terminals were renamed Terminal 1 and Terminal 2 and signs throughout the airport were redone to reflect the change and improve wayfinding. Eight restaurants and food vendors were added to the terminal. In December 2011, the renovation of the A concourse was completed with new bathrooms, flooring, lighting, and gate signs. Security checkpoints were reconstructed to be more integrated and to include new screening technology. Terrazzo floors were installed throughout the terminal. Art glass screens, designed by St. Louis-area artists, were installed throughout the terminal. A dedicated performance area, dubbed "St. Louis Stage", was added. Restrooms throughout the terminal were renovated; new restrooms were added to the baggage area. Entrances to the lower level of Terminal 1 were redesigned. Black Americans in Flight is a mural that depicts African American aviators and their contributions to aviation since 1917. It is located in Terminal 1 / Main Terminal on the lower level near the entrance to gates C and D and baggage claim. The mural consists of five panels and measures 8 feet tall and 51 feet long. The first panel includes Albert Edward Forsythe and C. Alfred Anderson, the first black pilots to complete a cross-country flight, the Tuskegee Institute and the Tuskegee Airmen, Eugene Bullard, Bessie Coleman and Willa Brown (first African American woman commercial pilot in United States). The second panel shows Benjamin O. Davis Jr., Clarence "Lucky" Lester and Joseph Ellesberry. The third panel shows Gen. Daniel "Chappie" James, Capt. Ronald Radliff and Capt. Marcella Hayes. The fourth and fifth panels show Ronald McNair, who died in the Space Shuttle Challenger disaster in 1986, Guion Bluford, who in 1983 became the first African American in space, and Mae Jemison, the first African America woman in space. Spencer Taylor and Solomon Thurman created the mural in 1990. The mural had a re-dedication ceremony in 2012. One aircraft from the Missouri History Museum currently hangs from Lambert's ceilings. This aircraft, a red Monocoupe 110 Special manufactured in St. Louis in 1931, hangs in the ticketing hall of Terminal 2. The airport has also played host to two other aircraft. A Monocoupe D-127 hung near the eastern security checkpoint in Terminal 1. Charles Lindbergh bought it in 1934 from the Lambert Aircraft Corporation and flew it as his personal plane. It was removed in 2018 and returned to the Missouri Historical Society, from which the plane had been on loan since 1979, for preservation purposes. Until 1998, a Ryan B-1 Brougham, a replica of the Spirit of St. Louis, hung next to the D-127. In 2008, China Cargo Airlines (a subsidiary of China Eastern Airlines) was reported to be considering a cargo hub at Lambert as part of its international cargo and passenger service expansion. Lambert was considered an attractive option as runway 11/29 would accommodate the large cargo aircraft, and the decline in passenger service during the first decade of the 2000s meant less congestion than busier airports such as Chicago O'Hare International Airport. Negotiations led to the 2009 creation of the public-private Midwest-China Hub Commission to develop an implementation plan. Planners for the cargo hub envisioned St. Louis as an Aerotropolis, an urban form whose layout, infrastructure, and economy is centered on an airport, offering its businesses speedy connectivity to suppliers, customers, and enterprise partners worldwide. Negotiations between the Chinese ambassador Zhou Wenzhong, China's Minister of Foreign Affairs Li Zhaoxing, Missouri Senators Kit Bond and Claire McCaskill and business leaders from the St. Louis region continued over the next two years. The United States Department of Commerce allowed expansion of the foreign trade zone near Lambert airport on February 13, 2009. In 2011, the "Aerotropolis Tax Credit" was introduced into the Missouri Senate. The bill provided $360 million of tax incentives to freight forwarders and for the development of warehouses, cold storage facilities and transportation connections in so-called "Gateway Zones," foreign trade zones located within 50 miles of St. Louis. The bill was debated in a special session during September 2011 but ultimately failed to gain enough support. In September 2011, the first China Cargo Airlines flight arrived from Shanghai–Pudong. The hub's future was questioned when the airline canceled every subsequent weekly flight in 2011. In 2013, the airline's lease for cargo space in the airport expired and was not renewed, seemingly ending the partnership. In total, only two flights took place in 2011, and all flights thereafter were suspended due to the failed Aerotropolis legislation and weak air freight demand around the world during that period. In 2013, a Texas company, Brownsville International Air Cargo Inc., expressed interest in building a dual-customs cargo facility on the site of the old McDonnell-Douglas complex on the north end of Lambert, citing excess airport capacity and a central U.S. location as conducive to a cargo operation. The idea was positively received by St. Louis and airport officials and won local approval, culminating in a three-year agreement to prepare studies and applications for the facility in late 2014. This dual-customs facility would permit pre-clearance of cargo bound for Mexico as well as U.S. Customs inspection of cargo imported from Mexico. The airport stated it was heavily focused on increasing cargo traffic as part of its 2015 Five Year Strategic Plan. To this end, the airport supported an extendable 20-year lease on 49 acres of airport land in order for it to be redeveloped into a large international air-cargo facility in three phases over 18 months. This lease was signed with Bi-National Gateway Terminal LLC and owner Ricardo Nicolopulos, who also owns Brownsville International Air Cargo Inc., and would incorporate the proposed dual-customs facility into the final design of the air-cargo facility, pending its approval by the Mexican government. Nicolopulos stated that Bi-National would invest $77 million into the first phase of the project, which would cover 32 acres and include a new international air-cargo terminal, and would not require extra funding from the airport. He reiterated his interest in and support of developing cargo operations in St. Louis, stating his belief that St. Louis could become a viable cargo competitor to Miami. The airport stands to receive at least $13.5 million in revenue from the facility over the initial 20-year lease. In January 2017, the Bi-National cargo facility was included on a list of important national infrastructure projects compiled by President Donald Trump's administration. The report stated overall construction costs of $1.8 billion and claimed that the facility could create 1,800 'direct' jobs. As of August 2017, no construction on the cargo facility has occurred; Bi-National has, however, filed a Brownfield Grant application with the state of Missouri in order to receive financial assistance for environmental cleanup of the site, and has also filed a Tenant Construction Application with the airport. Furthermore, Lambert airport, along with St. Louis County, have begun to undertake infrastructure improvements in order to better accommodate future shipping needs in and around the airport. The first of these was a rebuilding of Taxiway V and the taxiway's entrance to the "Northern Tract" of Lambert, providing common-use access to the Trans States Airlines ramp, the Airport Terminal Services ramp, and the Bi-National Air Cargo ramp. The rebuilt taxiway can accommodate the largest cargo planes, up to and including the 747-8F. The taxiway reconstruction cost approximately $6.1 million, funded via a grant from the Missouri Department of Transportation, and was finished in 2017. Other projects include the reconstruction of several roads leading to the airport to better facilitate heavy truck traffic and an extension of the Class 1 rail line adjacent to the airport to provide immediate train access from the Northern Tract cargo facilities. The overall projected cost for these near-term improvements is $20.7 million. Additionally, the airport is in the final stage of approval to become a USDA port of embarkation, allowing live animal charters to depart from St. Louis. In October 2017 the Ambassador of Mexico visited to discuss trade between St. Louis and Mexico. Also beginning in October was the aforementioned environmental cleanup of the cargo facility site. Domestic destinations from STL (excludes Alaska, Hawaii, and U.S. Territories). Red dots represent year-round destinations; Green dots represent seasonal destinations; Blue dots represent future destinations. 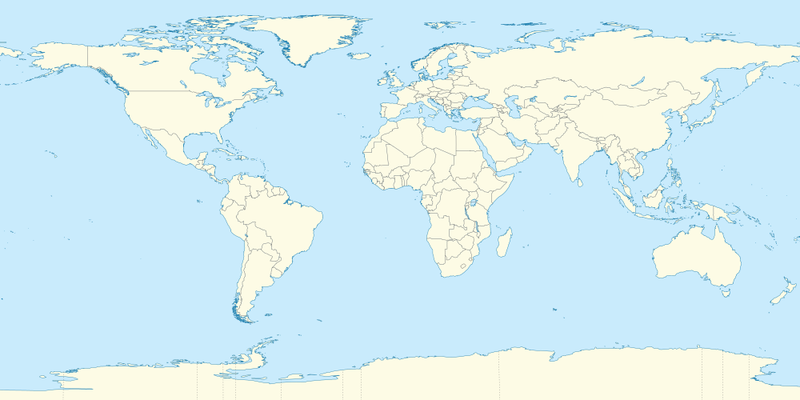 International destinations from STL (includes Alaska, Hawaii, and U.S. Territories). Red dots represent year-round destinations; Green dots represent seasonal destinations; Blue dots represent future destinations. 19,942,401 364,445 Concourse D completed. Southwest enters market. 20,352,383 2.06% 398,958 9.47% TWA acquires Ozark Airlines and its St. Louis hub. 19,923,774 5.06% 398,750 4.29% TWA moves headquarters to St. Louis and increases flights. 28,700,622 3.76% 471,481 2.64% Work begins on the W-1W airport expansion. East Terminal (Terminal 2) opens. 26,695,019 12.64% 452,866 0.87% American Airlines acquires TWA and its St. Louis hub. 25,626,114 4.00% 420,904 7.06% American begins to downsize the hub following 9/11. 15,205,944 3.46% 244,328 9.10% W-1W is completed with the opening of Runway 11/29. 15,384,557 1.18% 235,100 3.78% Terminal 1 renovations announced. 14,431,471 6.20% 234,834 0.11% Terminal 1 renovations begin. 12,796,302 11.33% 199,202 15.17% Southwest announces major service increases. 12,331,426 3.63% 160,633 19.36% American Airlines closes the St. Louis hub. 12,526,150 1.58% 179,074 11.48% The airport is hit by an EF4 tornado. Repairs begin. 13,959,126 9.46% 180,451 2.61% Airport modernization and renovation projects completed. 15,632,586 5.86% 186,079 0.51% Non-stop flights to Europe return briefly with the arrival of WOW air. There are 18 aircraft based at STL as of June 30, 2018. The airport is connected to MetroLink's Red Line via a station at both Terminal 1 and Terminal 2. 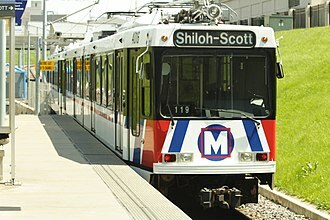 MetroLink lines provide direct or indirect service to downtown St. Louis, the Clayton area and Illinois suburbs in St. Clair County. Two MetroBus lines serve the Lambert Bus Port, which is located next to the intermediate parking lot and is accessible via a tunnel from Terminal 1. The airport is served by I-70; eastbound leads to downtown St. Louis and Illinois with a north/south connection at I-170 immediately east of the airport, while westbound leads to several exurbs of St. Louis in St. Charles County with a north/south connection at I-270 immediately west of the airport. August 5, 1936: Chicago and Southern Flight 4, a Lockheed 10 Electra headed for Chicago, crashed after takeoff killing all 8 passengers and crew. The pilot became disoriented in fog. August 1, 1943: During a demonstration flight of an "all St. Louis-built glider", a WACO CG-4A-RO, 42-78839, built by sub-contractor Robertson Aircraft Company, lost its starboard wing due to a defective wing strut support and plummeted vertically to the ground at Lambert Field, killing all on board, including St. Louis Mayor William D. Becker, Maj. William B. Robertson and Harold Krueger, both of Robertson Aircraft, Thomas Dysart, president of the St. Louis Chamber of Commerce, Max Doyne, director of public utilities, Charles Cunningham, department comptroller, Henry Mueller, St. Louis Court presiding judge, Lt. Col. Paul Hazleton, pilot Capt. Milton C. Klugh, and co-pilot/mechanic PFC Jack W. Davis, of the USAAF 71st Troop Carrier Squadron. The failed component had been manufactured by Robertson subcontractor Gardner Metal Products Company, of St. Louis, who, coincidentally, had been a casket maker. February 28, 1966: Astronauts Elliot See and Charles Bassett – the original crew of the Gemini 9 mission – were killed in the crash of their T-38 trainer while attempting to land at Lambert Field in bad weather. The plane crashed into the same McDonnell Aircraft building (adjacent to the airport) where their spacecraft was being assembled. March 20, 1968: A U.S. Navy F-4 Phantom crashed on takeoff during a test flight. The aircraft pitched up and stalled almost immediately after lifting from the runway; both crewmen were able to eject and were not seriously injured. The plane was destroyed in the ensuing explosion and fire. The crash was allegedly caused by a wrench socket, mistakenly left in the cockpit by maintenance crews, becoming lodged inside the control stick well on takeoff, jamming the stick in the full aft position. March 27, 1968: At about 6 p.m., an Ozark DC-9, operating as Flight 965, and an Interstate Airmotive Cessna 150F collided in flight approximately 1.5 miles north of the airport. Both aircraft were in the landing pattern for Runway 17 when the accident occurred. The Cessna was demolished by the collision and ground impact, and both occupants were fatally injured. The DC-9 sustained light damage and was able to effect a safe landing. None of its 44 passengers or five crewmembers were injured. The probable cause was determined to be a combination of inadequate VFR procedures in place at the airport, the failure of the DC-9 crew to notice the other plane in time, the controller's failure to ensure that the Cessna had received and understood important landing information, and the Cessna crew's deviation from their traffic pattern instructions and/or their continuation to a critical point in the traffic pattern without informing the controller of the progress of the flight. July 23, 1973: While on the approach to land at St. Louis International Airport, Ozark Air Lines Flight 809 crashed near the University of Missouri – St. Louis, killing 38 of the 44 persons aboard. Wind shear was cited as the cause. A tornado had been reported at Ladue, Missouri about the time of the accident but the National Weather Service did not confirm that there was a tornado. January 9, 1984: Douglas C-47B C-GSCA of Skycraft Air Transport crashed on take-off, killing one of its two crew members. The aircraft was on an international cargo flight to Toronto Pearson International Airport, Canada. Both engines lost power shortly after take-off. The aircraft had been fueled with JET-A instead of 100LL. April 8, 1990: A Missouri Air National Guard F-4 Phantom veered off the runway during takeoff, crashed, and burst into flames. The pilot suffered minor injuries after his ejection seat failed to deploy and he was forced to exit the burning wreckage, while the weapons officer fractured his left leg when he ejected from the plane. November 22, 1994: TWA Flight 427 collided with a Cessna 441, N441KM, at the intersection of runway 30R and taxiway Romeo. The MD-82 was taking off for Denver and had accelerated through 80 knots when the collision occurred. The MD-82 sustained substantial damage during the collision. The Cessna 441, operated by Superior Aviation, was destroyed. The pilot and the passenger were killed. PROBABLE CAUSE: "The Cessna 441 pilot's mistaken belief that his assigned departure runway was runway 30R, which resulted in his undetected entrance onto runway 30R, which was being used by the MD-82 for its departure. Contributing to the accident was the lack of Automatic Terminal Information Service and other air traffic control (ATC) information regarding the occasional use of runway 31 for departure. The installation and utilization of Airport Surface Detection Equipment (ASDE-3) and particularly ASDE-3 enhanced with the Airport Movement Area Safety System (AMASS), could have prevented this accident." September 6, 1944: The starboard engine of the sole completed McDonnell XP-67 fighter prototype, 42-11677, caught fire during a test flight. Test pilot E.E. Elliot executed an emergency landing at Lambert Field and escaped, but the fire rapidly spread, destroying the aircraft. This event was a crippling setback for the XP-67; the program had already been plagued by delays and technical problems, and the other prototype was only 15% complete, so flight testing could not promptly resume. Soon after the incident, USAAF leaders declared the XP-67 unnecessary, canceling the program. April 2, 1989: Joseph Rutherford Jr., a passenger bound for Sioux City, died after suffering fatal head and neck injuries when he was crushed by an airport trash compactor in Concourse D. Rutherford, reported to be highly intoxicated after drinking during his connecting flight from Memphis, stole a parked electric cart upon entering the concourse and began to drive it. Stopping the cart after a short distance, Rutherford attempted to hide from pursuers inside a maintenance room containing a trash compactor. Airport police eventually found that he had slid down an 18-inch aluminum chute into the trash compactor, which went into operation after his body triggered an electric eye while passing through the chute. In the "Airport" episode of the television show NewsRadio, bad weather keeps Bill and Dave at Lambert for the entire show. In "The Airport" episode of the television show Seinfeld, Jerry and Elaine leave from Lambert. In the "Meg and Quagmire" episode of the television show Family Guy, Glenn Quagmire tells a story about landing at Lambert. In the 1986 film Manhunter, FBI agents fly into Lambert during their pursuit of the killer. In the 1987 film Planes, Trains & Automobiles, Neal Page (Steve Martin) attempts to rent a car at Lambert, with disastrous consequences. Part of the 1991 film The Silence of the Lambs was shot at Lambert. In the 2003 film Anger Management, Dave Buznik (Adam Sandler) takes a flight to Lambert. Part of the 2006 film The Lucky Ones, set in Austin, Texas, was shot at Lambert. One scene from the 2009 film The Informant!, directed by Steven Soderbergh, was filmed at Lambert. The 2009 film Up in the Air was filmed in the St. Louis area, including in Lambert's Concourse D, between March 3 and the end of April 2009. In the film, George Clooney alludes to Lambert Field's rich history with the Wright Brothers and Charles Lindbergh. The 2017 film The Layover was partially filmed and set at Lambert Airport. Aircraft rescue and firefighting (ARFF) is provided by the St. Louis Fire Department, who operate out of two fire stations on the premises. U.S. Customs and Border Protection – The largest federal law enforcement agency of the United States Department of Homeland Security. Essential Air Service – STL acts as a hub for two EAS carriers. Raymond A. Johnson – One of the first flight instructors for the United States Air Force. Employed as a flight trainer for a time at Lambert Airfield. ^ a b c FAA Airport Master Record for STL (Form 5010 PDF). Retrieved June 9, 2018. ^ "CY2018 Passenger & Operation Statistics" (PDF). St. Louis Lambert International Airport. Retrieved January 29, 2019. ^ "Departure Statistics". Lambert–St. Louis International Airport. Retrieved January 29, 2019. ^ a b c d e "Historical Passenger Statistics Since 1990" (PDF). www.flystl.com. STL Airport. Retrieved 29 January 2019. ^ "Planning capacity" (PDF). www.faa.gov. 2017. ^ a b c "The History of Lambert – St. Louis International Airport". Lambert-St. Louis International Airport. Lambert-St. Louis International Airport. 2005. Archived from the original on February 4, 2005. Retrieved December 26, 2012. ^ Henry, Prince Joe (December 7, 2007). "Joe Gains Another Admirer: Kinloch's Sergeant of Police". River Front Times. Riverfront Times, LLC. Retrieved August 27, 2010. ^ John Aaron Wright. Kinloch: Missouri's first black city. Retrieved February 3, 2011. ^ "Lambert History". Lambert-Saint Louis International Airport. Archived from the original on August 22, 2011. Retrieved February 3, 2011. ^ Christensen, Lawrence O. (1999). Dictionary of Missouri Biography. University of Missouri Press. p. 469. ISBN 0-8262-1222-0. ^ a b c d e f g "Lambert – St. Louis International Airport > About Lambert > History > Timeline". July 22, 2012. Archived from the original on 2012-07-22. Retrieved November 16, 2018. ^ Mola, Roger. "Aircraft Landing Technology". U. S. Centennial of Flight Commission. Archived from the original on September 30, 2007. Retrieved July 24, 2007. ^ a b "The Navy at Lambert Field, 1925–1958 by George Everding, LCDR USN (ret)". Usgennet.org. Archived from the original on August 24, 2011. Retrieved November 22, 2011. 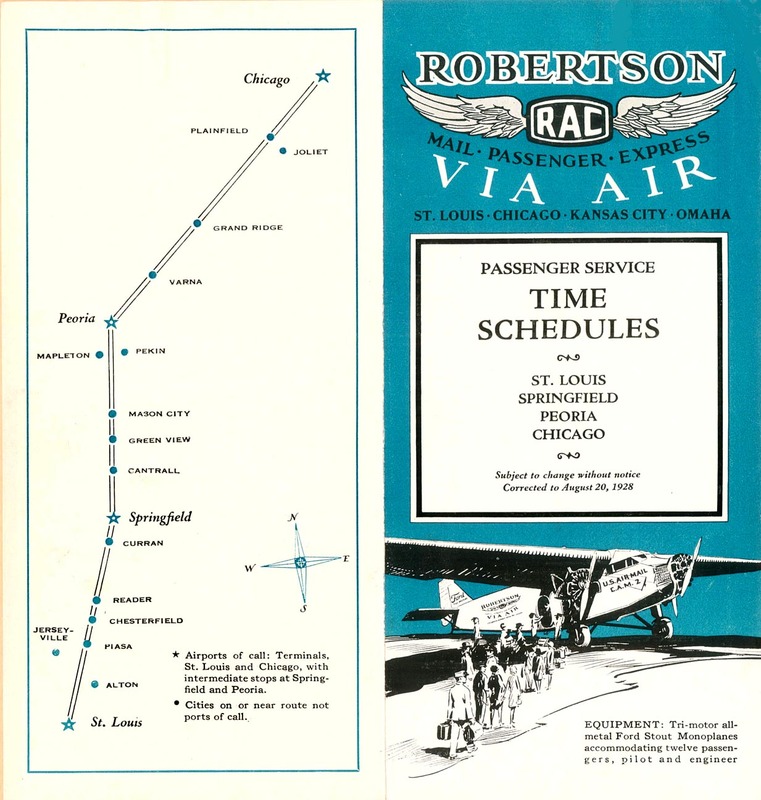 ^ "Robertson Air Lines". www.timetableimages.com. Retrieved November 16, 2018. ^ "Curtis Wright airline factory" (PDF). dnr.mo.gov. ^ a b Lambert, St Louis, (July 12, 2016). "History – St. Louis Lambert International Airport". Retrieved November 16, 2018. ^ "Lambert expansion: the never-ending story". Retrieved November 16, 2018. ^ Hampel, Paul. "Main Lambert terminal gets shiny, new roof". Retrieved November 16, 2018. ^ "Facility Orientation Guide – St. Louis Air Traffic Control Tower" (PDF). FAA. Retrieved August 8, 2017. ^ "Allegiant Air resumes flights out of MidAmerica St. Louis Airport". ^ Continuing Progress at Lambert. City of St. Louis Airport Authority. 1977. ^ "Timeline". City of St. Louis Airport Authority. Archived from the original on July 22, 2012. Retrieved July 2, 2012. ^ "Lambert International: Architectural Creativity in Steel" (PDF). Modern Steel Construction. Chicago: American Institute of Steel Construction, Inc. 26 (1): 5–9. 1986. Archived from the original (PDF) on May 14, 2012. Retrieved July 2, 2012. 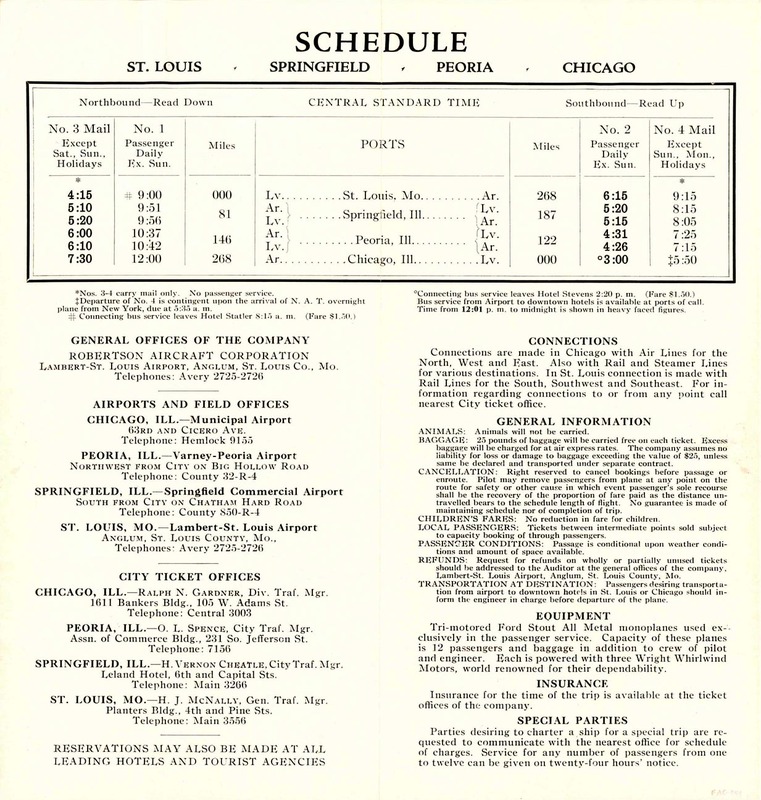 ^ "Airlines and Aircraft Serving Saint Louis Effective November 15, 1979". DepartedFlights.com. Retrieved 10 September 2015. ^ "STL: How To Build A Hub". TWA Mainliner. October 11, 1982. Archived from the original on October 17, 2015. Retrieved September 11, 2015. ^ "History". Lambert-St. Louis International Airport. Archived from the original on August 13, 2016. Retrieved September 11, 2015. ^ Fare and Service Changes at St. Louis Since the TWA-Ozark Merger, United States General Accounting Office. September 21, 1988. Retrieved July 27, 2013. ^ "TWA to relocate headquarters to St. Louis". Retrieved November 16, 2018. ^ "The Expansion Story". Archived from the original on May 1, 2008. Retrieved July 25, 2007. ^ a b Stoller, Gary (January 9, 2007). "St. Louis' Airports Aren't Too Loud: They're Too Quiet". USA Today. Retrieved July 25, 2007. ^ "Airport/Mass Transit November 2005 – Feature Story". Engineering News-Record. November 1, 2005. Retrieved July 25, 2007. ^ "Airports and Cities: Can they coexist?". SD Earth Times. Retrieved July 25, 2007. ^ "Historical Operation Statistics by Class for the Years: 1985–2006". Lambert–St. Louis International Airport. Archived from the original on July 11, 2007. Retrieved July 25, 2007. ^ a b "New $1 Billion Runway Opens This Week, But It's Not Needed Anymore". USA Today. April 11, 2006. Archived from the original on August 30, 2007. Retrieved July 25, 2007. ^ "Noise management report" (PDF). www.flystl.com. 2018. ^ HIRSCHFELD, SIMON (April 10, 2001). "AMR's Takeover of TWA Finalized". Retrieved November 16, 2018 – via LA Times. ^ "TWA's Last Flight". twaseniorsclub.org. Retrieved November 16, 2018. ^ "Stories" (PDF). www.bizjournals.com. December 24, 2001. ^ "The Last Day of TWA – A Sad Day For Aviation — Avgeekery.com – News and stories by Aviation Professionals". www.avgeekery.com. Retrieved November 16, 2018. ^ "TWA to be bought by American – Jan. 10, 2001". money.cnn.com. Retrieved November 16, 2018. ^ "Bureau of Transportation Statistics". Bureau of Transportation. Retrieved August 6, 2017. ^ "American Airlines, a History of Unsuccessful Mergers". Dallas News. Retrieved July 20, 2013. ^ "AA to cut back St. Louis operations: Travel Weekly". www.travelweekly.com. ^ Grant, Elaine X. (July 28, 2006). "TWA – Death Of A Legend". Retrieved November 16, 2018. ^ "Airtimes for early 2000's American Airlines flights at Lambert Airport" (PDF). airtimes.com. Retrieved April 8, 2019. ^ "Last two F-15's leave Lambert". St. Louis Public Radio. June 15, 2009. Retrieved April 8, 2019. ^ "Missouri Air National Guard celebrates End of Era with final F-15 departure". Whiteman AFB Home Page. July 6, 2016. Retrieved April 8, 2019. ^ "American Airlines Flight 2470 – First Commercial Airliner to Land on …". February 22, 2013. Archived from the original on February 22, 2013. Retrieved November 16, 2018. ^ a b c "St. Louis Int'l Modernizes Iconic Terminal Without Losing Connection to the Past – Airport Improvement Magazine". www.airportimprovement.com. Retrieved November 16, 2018. ^ Hinton, Christopher. "American Airlines to trim capacity, add new bag fee". Retrieved November 16, 2018. ^ Mutzabaugh, Ben (September 18, 2009). "With AA's Cuts, St. Louis Will Fall From the Ranks of Hub Cities". USA Today. Archived from the original on May 24, 2010. Retrieved September 18, 2009. ^ Leiser, Ken (September 18, 2009). "Airline blames cuts on restructuring". St. Louis Post-Dispatch. Archived from the original on September 24, 2009. Retrieved September 18, 2009. ^ "American Airlines' "cornerstone" worldview". Retrieved November 16, 2018. ^ "Consultants: We studied possibility of closing down one of American Airlines 'cornerstone' cities". April 26, 2012. Retrieved November 16, 2018. ^ Moseley, Jace (7 August 2017). "The Near Death and Resurgence of St. Louis International Airport". AirlineGeeks.com. Retrieved 5 April 2019. ^ "Southwest to Add Five More New Destinations from St. Louis in May". Retrieved 5 April 2019. ^ April 22nd Tornadic Supercell Greater St. Louis Metropolitan Area, National Weather Service, St. Louis, Missouri. (April 23, 2011). ^ Held, Kevin (April 23, 2011). "St. Louis Airport Storm Caught on Camera". KSDK. Archived from the original on January 3, 2013. Retrieved April 23, 2011. ^ Gay, Malcolm; Harris, Elizabeth A. (23 April 2011). "Tornadoes Tear Through St. Louis, Shutting Down the Airport". The New York Times. Retrieved 5 April 2019. ^ Bowers, Cynthia (April 23, 2011). "Residents: St. Louis Was "Bedlam" During Tornado". CBS News. Retrieved April 24, 2011. ^ Salter, Jim; Suhr, Jim (April 23, 2011). "Tornado Cleanup Starts Quickly in St. Louis Area". Yahoo! News. Associated Press. Retrieved April 23, 2011. ^ Moore, Bryce (April 23, 2011). "Lambert Passengers Watch Plane Move, Then Evacuate Terminal". Archived from the original on April 25, 2011. Retrieved April 23, 2011. ^ "UPDATE: Lambert Reopening Today, Expects to Be at 70 Percent Capacity Sunday". St. Louis Post-Dispatch. April 23, 2011. Retrieved April 24, 2011. ^ a b Leiser, Ken. "Lambert Opens Refurbished C Concourse After Twister". St. Louis Post Dispatch. Retrieved July 1, 2012. ^ Peterson, Deb (November 8, 2011). "No Joke – TSA Names Lambert 'Airport of the Year'". St. Louis Post Dispatch. Retrieved November 22, 2011. ^ "Kwame Building Group – Lambert-St. Louis International – Airport Experience Program". October 17, 2015. Archived from the original on 2015-10-17. Retrieved November 16, 2018. ^ "Lambert-St. Louis Int'l. website, Retrieved July 19, 2013". Archived from the original on 2014-03-19. ^ "lam6535 Brochure_insert.ai" (PDF). Retrieved 2018-11-16. ^ "Retrieved September 9, 2016". Bizjournals.com. Retrieved 2018-11-16. ^ Post-Dispatch store. "Retrieved September 9, 2016". Stltoday.com. Retrieved 2018-11-16. ^ On Air 9:52AM (2016-09-07). "Retrieved September 9, 2016". Ksdk.com. Retrieved 2018-11-16. ^ Thorsen, Leah (October 26, 2016). "Airport in St. Louis likely will get a new name; FAA approval still needed". St. Louis Post-Dispatch. Retrieved November 2, 2016. ^ Thorsen, Leah. "It's official: St. Louis Lambert International Airport is our airport's new name". ^ Manager, Dan Fredman Digital Content. "With Southwest expansion in mind, Lambert renovations underway". Retrieved November 16, 2018. ^ Lambert, St Louis, (May 18, 2017). "Southwest Airlines Announces STL as International Gateway – St. Louis Lambert International Airport". Retrieved November 16, 2018. ^ "Agencies Boost STL's Outlook Ahead of Bond Refunding". Lambert Airport. May 30, 2017. Retrieved January 18, 2018. ^ "Fitch Upgrades St. Louis Lambert Int'l Airport (MO) to 'A-'; Outlook Revised to Stable". Fitch Ratings. October 6, 2017. Retrieved January 18, 2018. ^ "Press Release – U.S. Department of Transportation Announces $282.6 Million in Infrastructure Grants to 67 Airports in 29 States". FAA. August 21, 2017. Retrieved August 22, 2017. ^ Mutzabaugh, Ben (August 23, 2017). "WOW Air, known for $99 Europe fares, adds four new U.S. cities". USA Today. Retrieved August 23, 2017. ^ "Wow Air expands planned Lambert flights, offers more $99 fares to Iceland". STLToday. January 25, 2018. Retrieved June 10, 2018. ^ "Tourism and Business Are Winners with New WOW Air Service between STL and Iceland". Lambert Airport. May 21, 2018. Retrieved June 10, 2018. ^ Thorsen, Leah. "Wow, that was quick: Wow Air to end flights from Lambert in January". St. Louis Post Dispatch. Retrieved 2018-10-16. ^ Lambert, St Louis, (October 15, 2018). "Announcement Regarding WOW air – St. Louis Lambert International Airport". Retrieved November 16, 2018. ^ "American Airlines to close St. Louis pilot base in September 2018". October 30, 2017. Retrieved November 16, 2018. ^ "153 pilots affected in American Airlines closure" (PDF). www.bizjournals.com. July 6, 2018. ^ "American Airlines Inc" (PDF). jobs.mo.gov. ^ Lambert, St Louis, (March 2, 2018). "STL Airlines to Invest $50 million for Jet Fuel Storage Facility – St. Louis Lambert International Airport". Retrieved November 16, 2018. ^ "Twitter". mobile.twitter.com. Retrieved November 16, 2018. ^ a b "New airline offering direct flights from St. Louis to Tampa and Ft. Myers". June 26, 2018. Retrieved November 16, 2018. ^ Jan 8, 2019 (2019-01-08). "Sun Country Airlines announces two new destinations from Lambert | News Headlines". kmov.com. Retrieved 2019-04-05. ^ "Lambert airport to receive $10 million federal grant for runway repair" (PDF). www.bizjournals.com. July 17, 2018. ^ "TSA announces new X-ray technology roll-out plan". July 30, 2018. Retrieved November 16, 2018. ^ Lambert, St Louis, (August 8, 2018). "Moody's Upgrades STL Airport Bonds to A2, Outlook Stable – St. Louis Lambert International Airport". Retrieved November 16, 2018. ^ Lambert, St Louis, (October 9, 2018). "Fitch Ratings Issues Positive Outlook for Airport Revenue Bonds – St. Louis Lambert International Airport". Retrieved November 16, 2018. ^ "RFQ for Terminal 2 Baggage Carousel Expansion at St. Louis Lambert International Airport – Board of Public Service". www.stl-bps.org. Retrieved November 16, 2018. ^ "Public notice" (PDF). www.flystl.com. 2018. ^ "RFQ – Design Services for Terminal 2 Baggage Carousel Expansion Lambert airport – Updated 11-12-18 *List May Not Be Current* – Board of Public Service". www.stl-bps.org. Retrieved November 16, 2018. ^ Lambert, St Louis, (October 3, 2018). "STL, Southwest Airlines Commit to Expanding T2 Bag Claim – St. Louis Lambert International Airport". Retrieved November 16, 2018. ^ Schlinkmann, Mark. "Lambert plans a third baggage carousel in Southwest terminal". Retrieved November 16, 2018. ^ Thorsen, Leah. "Slay wants to look at putting Lambert airport under private management". Retrieved November 16, 2018. ^ Altman, Maria. "FAA accepts initial application for Lambert privatization". Retrieved November 16, 2018. ^ a b c "Bureau of Transportation Statistics – St. Louis International Airport". BTS. Retrieved 19 February 2019. ^ "World's sky-high civilian air traffic control towers". wordpress.com. Retrieved August 5, 2017. ^ "Lambert St. Louis Airport Control Tower, Bridgeton". emporis.com. Retrieved August 5, 2017. ^ "AirNav: KSTL – St Louis Lambert International Airport". www.airnav.com. Retrieved November 16, 2018. ^ "St. Louis Airport Reopens, One Concourse Remains Closed". 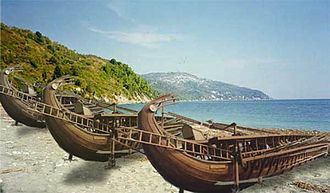 Travelpulse.com. April 25, 2011. Retrieved November 22, 2011. ^ "American Airlines Admirals Club St. Louis Airport". sleepinginairports.net. Retrieved August 3, 2017. ^ a b c d e "STL Airport Diagram" (PDF). flystl.com. Retrieved 5 April 2019. ^ "STL Gate Summary" (PDF). ^ Clever, Boxing (January 4, 2018). "Wingtips St. Louis Lounge Opens in STL's Terminal 2 – St. Louis Lambert International Airport". ^ Tribune, Sharman Stein. Special to the. "GIANT DEAL BRINGS RELIEF, BUT TOUCH OF SADNESS, TO ST. LOUIS". Retrieved November 16, 2018. ^ Brown, Lisa. "Boeing moving defense HQ from St. Louis to D.C. area". Retrieved November 16, 2018. ^ "Boeing Picks St. Louis for Potential Jet Plant But There's a Catch". May 15, 2017. Retrieved November 16, 2018. ^ CNBC (May 8, 2017). "Under Trump, Boeing's Super Hornet gets a boost: Production set to double". Retrieved November 16, 2018. ^ "Boeing moving Phantom Works headquarters to Seattle | [primary-term] content from". Aviation Week. 1999-09-16. Retrieved 2019-04-05. ^ "Boeing Announces Re-alignment of Phantom Works Organization; Headquarters Moves to Seattle". Retrieved November 16, 2018. ^ McIntosh, Andrew (December 21, 2016). "Boeing-Saab T-X military training jet makes first flight". STL Business Journal. Retrieved August 22, 2017. ^ Barker, Jacob (May 15, 2017). "If it wins trainer contract, Boeing will assemble T-X in St. Louis". STL Today. Retrieved August 22, 2017. ^ Barker, Jacob (April 8, 2018). "Refueling drone could be big contract for Boeing St. Louis plant". STL Today. Retrieved April 10, 2018. ^ "Contracts for August 30, 2018". Retrieved November 16, 2018. ^ Masunaga, Samantha. "Boeing wins contract to build four flying drone tankers for the Navy". latimes.com. Retrieved November 16, 2018. ^ a b c "Are you a robot?". Bloomberg. Retrieved 2019-04-05. 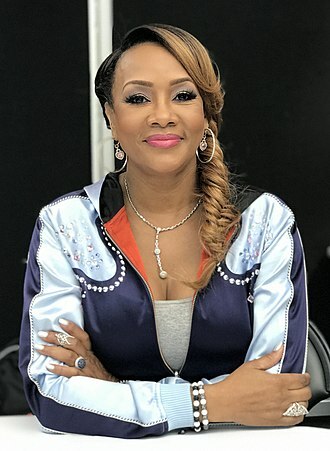 ^ a b Insinna, Valerie (September 28, 2018). "US Air Force awards $9B contract to Boeing for next training jet". Retrieved November 16, 2018. ^ Mehta, Aaron (October 11, 2018). "Lockheed, Leonardo DRS won't protest T-X, handing program to Boeing". Retrieved November 16, 2018. ^ Barker, Jacob. "Boeing's St. Louis plant wins major $9.2 billion contract for new Air Force training jet". Retrieved November 16, 2018. ^ "Boeing gets $90m for MQ-25 studies and analysis". Naval Today. 2018-12-20. Retrieved 2019-04-05. ^ "Boeing wins $4 billion U.S. defense contract for Navy F/A-18 jets". St. Louis Post-Dispatch. Retrieved April 5, 2019. ^ "World Airline Directory." Flight International. March 30, 1985. 105. ^ "Airport Terminal Services". ATS STL. ATS Inc. Retrieved 4 August 2018. ^ a b c "Airport Experience Projects". Lambert–St. Louis International Airport. Archived from the original on October 15, 2011. Retrieved November 22, 2011. ^ "Lambert Installing New Signs, Renaming Terminals" (PDF). Lambert–St. Louis International Airport. December 2, 2009. Archived from the original (PDF) on December 4, 2010. Retrieved December 12, 2009. ^ "News Release" (PDF). Lambert–St. Louis International Airport. June 9, 2009. Archived from the original (PDF) on March 19, 2012. Retrieved November 22, 2011. ^ "News Release". Lambert–St. Louis International Airport. Archived from the original on November 4, 2011. Retrieved November 22, 2011. ^ "News Release" (PDF). Lambert–St. Louis International Airport. February 18, 2010. Archived from the original (PDF) on August 22, 2011. Retrieved November 22, 2011. ^ "News Release" (PDF). Lambert–St. Louis International Airport. July 1, 2011. Archived from the original (PDF) on August 28, 2011. Retrieved November 22, 2011. ^ Lambert Upgrading Terminal 1 Entrances Following Tornado Archived March 26, 2014, at the Wayback Machine. Flystl.com. Retrieved on August 16, 2013. ^ Brownlee Jr., Henry T. (February 2010). "Linking the Past to the Future" (PDF). Boeing Frontiers. Retrieved July 4, 2010. ^ "Many St. Louis Sites Significant in Black History: "Black Americans in Flight" Mural". St. Louis Convention & Visitors Commission. Retrieved July 4, 2010. ^ Gooden, Christian. "Lambert rededicates its "Black Americans In Flight" mural". Retrieved November 16, 2018. ^ "Charles Lindbergh's Monocoupe – St. Louis, MO – Static Aircraft Displays". Groundspeak, Inc. December 15, 2008. Retrieved July 25, 2010. ^ "Lindbergh Monocoupe Exhibit Ending its Run at STL Airport". Lambert Airport. June 7, 2018. Retrieved June 10, 2018. ^ Mullen, Robert; Smith, Sharon (Spring 2008). "Midnight Maintenance: Caring for Lindbergh's Monocoupe". Missouri History Museum. Retrieved July 25, 2010. ^ Gateway to the East: St. Louis Seeks to be China's Freight And Commercial Hub Archived March 22, 2012, at the Wayback Machine. St. Louis Commerce Magazine. June 2008. Retrieved June 10, 2009. ^ Commission Looks to Bring Chinese Air Freight to St. Louis. St. Louis Business Journal. January 19, 2009. Retrieved June 10, 2009. ^ "Local Media Fail St. Louis with Aerotropolis Reporting". nextSTL. July 19, 2011. Retrieved November 22, 2011. ^ Binns, Evan (February 16, 2009). "Lambert Foreign Trade Zone Expanded". St. Louis Business Journal. Retrieved June 10, 2009. ^ "Aerotropolis Tax Credit" (PDF). ^ Logan, Tim (April 14, 2011). "Unpacking the "Aerotropolis" Tax Credits". St. Louis Post Dispatch. Retrieved November 22, 2011. ^ Young, Virginia (August 25, 2011). "Leaders Looking for Speedy Mo. Special Session". St. Louis Post Dispatch. Retrieved November 22, 2011. ^ Flagg, Sarah (November 10, 2011). "Fuhr Addresses Shortfalls of Special Session at Town Hall Meeting". Mehlville-Oakville Patch. Archived from the original on April 26, 2012. Retrieved November 22, 2011. ^ "First China Cargo Flight Arrives at Lambert". KSDK. September 23, 2011. Retrieved November 22, 2011. ^ Frankel, Todd C. (11 December 2011). "Lambert and the allure of big planes from China". St. Louis Post-Dispatch. Retrieved 1 July 2017. ^ "China Eastern Airlines Lets Lease Run Out at Lambert". October 1, 2013. Archived from the original on August 6, 2017. Retrieved January 27, 2019. ^ 314-340-8291, Tim Logan tlogan@post-dispatch.com. "St. Louis airport backers take another stab at cargo hub tax credits". ^ "Lambert backs development of Mexican cargo facility". STLToday. November 6, 2013. Retrieved August 5, 2017. ^ "Dual customs facility at Lambert gets key support". STLToday. October 3, 2014. Retrieved August 5, 2017. ^ "Lambert airport leaders to stress cargo, private partnerships in next five years". STLToday. February 4, 2015. Retrieved August 5, 2017. ^ "Plans for air-cargo terminal at Lambert move forward". STLToday. May 6, 2015. Retrieved August 5, 2017. ^ "Air-cargo facility at Lambert named in report of Trump-backed projects". STLToday. January 24, 2017. Retrieved August 7, 2017. ^ "January 2017 Airport Commission Meeting Minutes" (PDF). January 4, 2017. Archived from the original (PDF) on October 8, 2017. Retrieved October 8, 2017. ^ "Project sheets" (PDF). www.thefreightway.com. 2018. ^ "2017 FREIGHT DEVELOPMENT PLAN ST LOUIS REGIONAL FREIGHTWAY" (PDF). www.thefreightway.com. Retrieved August 8, 2017. ^ "St. Louis Regional Freightway – 2016 Freight Development Project List" (PDF). www.thefreightway.com. Retrieved August 8, 2017. ^ "Project list" (PDF). www.thefreightway.com. ^ "St. Louis Airport Commission Meeting October Minutes" (PDF). Archived from the original (PDF) on November 10, 2017. Retrieved November 11, 2017. ^ "Air Canada flight schedules". Air Canada. Retrieved 7 January 2017. ^ "Air Choice One at St. Louis". Archived from the original on June 27, 2017. Retrieved January 29, 2017. ^ "Alaska Airlines flight timetable". alaskaair.com. Alaska Airlines. Retrieved 29 January 2017. ^ a b "American Airlines flight schedules and notifications". aa.com. American Airlines. Retrieved 7 January 2017. ^ "Cape Air schedules". Cape Air. Retrieved 29 January 2017. ^ "Contour Airlines to announce jet service". sustainableozarks.org. ^ a b "Flight schedules for Delta". Delta Air Lines. Retrieved 7 January 2017. ^ "Frontier Airlines schedule". Frontier Airlines. Retrieved 7 January 2017. ^ "Southwest Airlines Adds New Nonstop Flights To Route Map". Southwest Airlines Newsroom. Retrieved 5 April 2019. ^ "Southwest Flight schedules". Southwest Airlines. Retrieved 9 January 2017. ^ "Lambert's newest airline adds another destination from St. Louis". bizjournals.com/stlouis. St. Louis Business Journal. Retrieved April 8, 2019. ^ a b "Sun Country adds seasonal flights to Portland and Minneapolis from St. Louis". stltoday.com. STL Today. Retrieved April 1, 2019. ^ a b "United Airlines timetable". United Airlines. Retrieved 7 January 2017. ^ Clever, Boxing (July 12, 2016). "Public Notices and Reports – St. Louis Lambert International Airport". ^ "Historical Operations Statistics since 1990" (PDF). www.flystl.com. STL Airport. Retrieved 29 January 2019. ^ a b "February 2019 Air Traffic Activity Summary" (PDF). www.flystl.com. STL Airport. Retrieved 21 March 2019. ^ "Welcome to Lambert-St. Louis International Airport". July 11, 2007. Archived from the original on 2007-07-11. Retrieved November 16, 2018. ^ "Welcome to Lambert-St. Louis International Airport". June 12, 2008. Archived from the original on June 12, 2008. Retrieved November 16, 2018. ^ "Statistics" (PDF). flystl.com. Archived from the original (PDF) on May 2, 2018. Retrieved January 27, 2019. ^ "2016 Air Traffic Activity Summary" (PDF). www.flystl.com. STL Airport. Archived from the original (PDF) on August 17, 2017. Retrieved August 16, 2017. ^ "KSTL Airport Master Record". www.gcr1.com. FAA. Retrieved 20 November 2018. ^ "LAMBERT-ST LOUIS INTL AIRPORT (ST LOUIS, MO) KSTL OVERVIEW". FlightAware. Retrieved 8 November 2017. ^ "MetroLink". Metrostlouis.org Site. April 8, 2019. Retrieved April 8, 2019. ^ "St. Louis Airport Bus". www.saint-louis-airport.com. Retrieved 8 April 2019. ^ Bowers, Peter M., "Breezing Along with the Breeze", Wings, Granada Hills, California, December 1989, Volume 19, Number 6, p. 19. ^ Diehl, Alan E., PhD, "Silent Knights: Blowing the Whistle on Military Accidents and Their Cover-ups", Brassey's, Inc., Dulles, Virginia, 2002, Library of Congress card number 2001052726, ISBN 978-1-57488-412-8, pages 81–82. ^ "Losing The Moon". St. Louis Magazine. May 2006. ^ CriticalPast (May 6, 2014). "US Navy F-4J Phantom II aircraft takeoff and crash in St. Louis, Missouri; Fireme...HD Stock Footage". Retrieved April 5, 2019 – via YouTube. ^ "Accident report" (PDF). 1968. ^ St. Louis, MO Airliner Crashes On Landing, July 1973 | GenDisasters ... Genealogy in Tragedy, Disasters, Fires, Floods. .gendisasters.com. Retrieved on August 16, 2013. ^ "C-GSCA Accident Description". Aviation Safety Network. Retrieved July 27, 2010. ^ "F-4 crashes; no fatalities". UPI. Retrieved April 5, 2019. ^ Aircraft Accident Report, Runway Collision Involving Trans World Airlines Flight 427 And Superior Aviation Cessna 441, Bridgeton, Missouri, November 22, 1994 (PDF). National Transportation Safety Board. August 30, 1995. Retrieved August 24, 2016. ^ Mesko, Jim (2002). FH Phantom/F2H Banshee in action. Carrollton, Texas, United States: Squadron/Signal Publications, Inc. pp. 4–5. ISBN 0-89747-444-9. ^ "Man crushed in airport trash compactor". UPI. Retrieved December 18, 2017. ^ a b c Williams, Joe (December 11, 2009). "Clooney Was Here: St. Louis Locations in 'Up in the Air'". St. Louis Post-Dispatch. Archived from the original on December 30, 2009. Retrieved December 11, 2009. ^ a b c d Dohack-McCrary, Caroline (March 13, 2011). "Missouri Boasts a Proud History of Being on the Silver Screen". Columbia Daily Tribune. Archived from the original on March 21, 2012. Retrieved March 13, 2011. ^ Williams, Joe (January 28, 2009). "Steven Soderbergh, Film Revolutionary". St. Louis Post-Dispatch. Archived from the original on September 18, 2012. Retrieved January 29, 2009. ^ Rubin, Ann (December 12, 2008). "George Clooney to Film Next Movie in St. Louis". KSDK. Retrieved December 29, 2008. ^ "Official Information for the St. Louis film "Up in the Air"". Missouri Film Commission Project Hotline. January 15, 2009. Archived from the original on May 10, 2008. Retrieved January 18, 2009. ^ Reker, Bill (December 12, 2009). ""Up in the Air" Movie Opens: Lambert Airport Has Prominent Role". KMOX. Archived from the original on December 18, 2009. Retrieved December 12, 2009. ^ Fleming Jr., Mike (March 25, 2015). "Lea Michele, Kate Upton, William H. Macy Team For Road Trip Comedy 'The Layover'". Deadline Hollywood. Retrieved August 1, 2017. Wikimedia Commons has media related to St. Louis Lambert International Airport. The Wright Exhibition Team was a group of early aviators trained by the Wright brothers at Wright Flying School in Montgomery, Alabama in March 1910. The group was formed in 1910 at the suggestion of Augustus Roy Knabenshue, the team made its first public appearance on June 13,1910 at the Indianapolis Motor Speedway. The team performed aerial shows and set records for altitude and endurance, pilots were paid $20 per week and $50 a day when flying. By August there were five separate teams flying at one time with $186,000 in receipts, Ralph Johnstone was the first to be killed. After attempting another altitude record over Denvers Overland Park in November, Johnstone put his plane into Walter Richard Brookins spiral dip dive, the plane plummeted to the ground, and Johnstone was crushed. A month later, on New Years Eve,1910, Arch Hoxsey was killed in an identical crash, although the team had lost its star fliers, newer pilots trained by Welsh joined the team and continued performing around the country at 25 locations. Kinloch is a city in St. Louis County, United States. The population was 299 as of the 2010 census, the oldest African-American community to be incorporated in Missouri, Kinloch was home to a vibrant and flourishing black community for much of the 19th and 20th century. It began to decline in the 1980s, when the City of St. Louis began to buy up property due to an FAA noise-abatement program for nearby Lambert-St. Between 1990 and 2000, Kinloch lost more than 80 percent of its population, in recent years, there have been efforts to rebuild the city. The current city of Kinloch grew up around Kinloch Park, a commuter suburb first developed in the 1890s, a Mrs. B and her husband are thought to be the first black family to purchase a home in Kinloch Park. As soon as the neighbors discovered the new owners were black they sold their properties, in a few years, more than 30 black families had bought into a six-block area that became called South Kinloch Park. 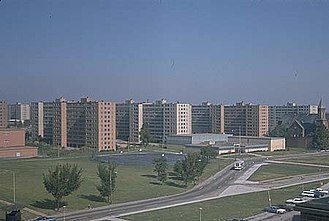 Kinloch, as an African American community, developed out of a land purchase model similar to the Brooklyn, since it was not legal to sell directly to blacks, the Olive Street Terrace Realty Corporation sold the parcels to whites for an average price of $150. The new owners sold the plots to blacks for an average of $350. This allowed the company to use the white peoples loans as collateral for further bank notes, to get white investors, the company circulated testimonials of investors who paid in $50 towards a parcel and received returns of $500 to $1000 on the investment. In an advertisement to the Argus, Olive Street Terrace Realty said, more than a hundred homes, three churches and a splendid public school have been built in a few years. The Kinloch Park development had a facility called Kinloch Track. When Missouri outlawed the sport, the grounds were taken over by Kinloch Airfield, the Aero Club of Saint Louis hosted the first international air meet in October 1910, where Theodore Roosevelt became the first U. S. president to fly in an airplane. Pilot Arch Hoxsey flew the president around for three minutes in one of the Wright Brothers six planes they had brought in. The Kinloch Airfield saw the first control tower, the first meal served on a flight, the first airmail shipped, the first parachute jump, the first aerial photo and the first animal airlifted. Multi-Aero, Inc. doing business as Air Choice One, is an American airline with its headquarters in Concord, Missouri in Greater St. Louis. It acts as a regional airline offering commuter flights from Lambert-St, Louis International Airport, OHare International Airport and Minneapolis-St. Paul International Airport to smaller regional airports, subsidized under the Essential Air Service program. Multi-Aero was founded in 1979 under the name Multi-Aero Corporation, in October 2009 Air Choice One won the EAS contract to serve Decatur and Burlington, Iowa. As a stipulation for obtaining both extensions Air Choice One implemented systems for electronic ticketing and baggage agreements via WorldSpan in December 2012, in February 2014 Air Choice One was awarded by the DOT a 4-year extension on their Jonesboro, Arkansas EAS contract. In the same month, there were three proposals sent out by them to the cities for EAS service, Michigan, Fort Dodge, Iowa. Previously in 2011, Air Choice One submitted a proposal to the US DOT to serve Muscle Shoals with flights to either Atlanta, pending acceptance of the proposal, the airline was planning to begin flights in as little as 30 days. Hyannis Air Service, Inc. operating as Cape Air, is an airline headquartered at Barnstable Municipal Airport in Barnstable, United States. It operates scheduled services in the Northeast, the Caribbean, Eastern Montana. Flights in Micronesia are operated as United Express flights through a code share partnership with United Airlines, flights between Hyannis and Nantucket, are operated under the Nantucket Airlines brand, operated by Hyannis Air Service, Inc. As of November 2013, Cape Air received $32,241,274 in annual subsidies for Essential Air Services that they provided to rural airports in the U. S. The airline was co-founded in 1988 by company pilots Craig Stewart and Dan Wolf, Cape Air flew between Provincetown and Boston in Massachusetts, but throughout the early 1990s new routes were added to destinations across southeastern New England. In 1994, Cape Air and Nantucket Airlines merged and now offer hourly flights between Nantucket and Hyannis, Services in Florida and the Caribbean were added in the late 1990s. 2004 marked the year of FAR Part 121 certification and a new hub of operations in Guam. This included a new fleet type consisting of three ATR-42 Turboprop aircraft, the startup team, led by Pacific Administrator, Captain Russell Price, launched scheduled service in July 2004 with the three ATR aircraft and two of the C402. Service was as a Continental Connection Carrier, flying from Guam to the Northern Mariana Islands of Saipan, in late 2007, the airline began a new round of expansion in the Northeast and Midwest. On November 1,2007, the airline service between Boston and Rutland, with three daily round trips. The route is operated under contract with the U. S. government Essential Air Service program, with the help of an intrastate minimum revenue guarantee, Cape Air expanded into Indiana on November 13,2007, offering flights from Indianapolis to Evansville and South Bend. Passenger revenue did not grow enough to make the operation economically sustainable once the revenue guarantee ended. Trans World Airlines was a major American airline from 1924 until 2001. It was formed as Transcontinental & Western Air to operate a route from New York City to Los Angeles via St. Louis, Kansas City, and other stops, with Ford Trimotors. With American and Eastern, it was one of the Big Four domestic airlines in the United States formed by the Spoils Conference of 1930. Hughes gave up control in the 1960s, and the new management of TWA acquired Hilton International and Century 21 in an attempt to diversify the companys business. As the Airline Deregulation Act of 1978 led to a wave of airline failures, start-ups, Carl Icahn acquired control of TWA and took the company private in a leveraged buyout in 1988. TWA became saddled with debt, sold its London routes, underwent Chapter 11 restructuring in 1992 and 1995, in 2001, TWA filed for a third and final bankruptcy and was acquired by American Airlines. American laid off many former TWA employees in the wake of the September 11,2001 attacks and closed its St.
Louis hub in 2003. TWA was headquartered at one time in Kansas City and planned to make Kansas City International Airport its main domestic and international hub, the airline developed its largest hub at Lambert-St. Its main trans-Atlantic hub was the TWA Flight Center at John F. Kennedy International Airport in New York City, TWAs corporate history dates from the July 16,1930, forced merger of Transcontinental Air Transport and Western Air Express to form Transcontinental & Western Air. The companies merged at the urging of Postmaster General Walter Folger Brown, both airlines brought high-profile aviation pioneers who would give the airline the panache of being called The Airline Run by Flyers. The airlines were known for years as being on the cutting edge of aviation. Transcontinental, the bigger of the two, had the expertise of Charles Lindbergh and was already offering a 48-hour combination of plane. 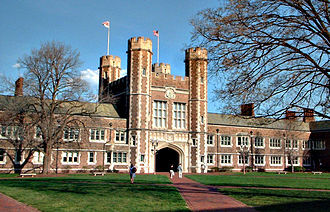 Western, which was older, having been founded in 1925, had the expertise of Jack Frye. On October 25,1930, the airline offered one of the first all-plane scheduled service from coast to coast, the route took 36 hours and initially called for overnights in Kansas City. Southwest Airlines Co. is a major U. S. airline, the worlds largest low-cost carrier, headquartered in Dallas, Texas. The airline was established in 1967 by Herb Kelleher and adopted its current name in 1971, the airline has more than 53,000 employees as of October 2016 and operates more than 3,900 departures a day during peak travel season. As of 2014, it carried the most domestic passengers of any U. S. airline, as of December 2016, Southwest Airlines had scheduled services to 101 destinations in the United States and eight additional countries. Service to both Grand Cayman and Cincinnati begins June 4,2017, Southwest Airlines has used only Boeing 737s, except for the period from 1979 to 1987 when it leased some Boeing 727-200s from Braniff International Airways. As of January 2016, Southwest is the largest operator of the Boeing 737 worldwide, with over 700 in service, in 1966 Southwest Airlines was founded by Rollin King and Herbert Kelleher, in 1967 it was incorporated as Air Southwest Company. It was not until 1971 that the airline began scheduled flights, the same year the organization adopted the name Southwest Airlines. The expansion of flights started in 1975, to cities throughout Texas, Service to the East and the Southeast started in the 1990s. The company has employed humor in its advertising, the airlines current slogan is Low fares. Instead of a lawsuit, the CEOs for both companies staged an arm wrestling match, a promotional video was created showing the CEOs training for the bout and distributed among the employees and as a video press release along with the video of the match itself. Herb Kelleher lost the match for Southwest, with Stevens Aviation winning the rights to the phrase, kurt Herwald, CEO of Stevens Aviation, immediately granted the use of Just Plane Smart to Southwest Airlines. The net result was both companies having use of the trademark, $15,000 going to charity and good publicity for both companies, Southwest Airlines is the official commercial airline of the Honor Flight Network. Honor Flights are dedicated to bringing aging and ailing veterans to visit the monuments in Washington. The Southwest Airlines headquarters is located on the grounds of Dallas Love Field in the Love Field neighborhood of Dallas, Texas, on September 17,2012, Southwest broke ground on a new Training and Operational Support building. The TOPS Building is across the street from its current headquarters building, the property includes a two-story,100, 000-square-foot operations building that can withstand an EF3 tornado. It includes a four-story,392, 000-square-foot office and training facility with two levels devoted to each function, the new facilities house 24-hour coordination and maintenance operations, customer support and services, and training. The project was completed in late 2013, with occupancy beginning in 2014, as of December 31,2016, Southwest Airlines has more than 53,000 employees. Gary C. Kelly is Chairman and CEO of Southwest Airlines, Kelly replaced former CEO Jim Parker on July 15,2004 and assumed the title of President on July 15,2008, replacing former President Colleen Barrett. St. Louis is an independent city and major U. S. port in the state of Missouri, built along the western bank of the Mississippi River, on the border with Illinois. Prior to European settlement, the area was a regional center of Native American Mississippian culture. The city of St. Louis was founded in 1764 by French fur traders Pierre Laclède and Auguste Chouteau, in 1764, following Frances defeat in the Seven Years War, the area was ceded to Spain and retroceded back to France in 1800. In 1803, the United States acquired the territory as part of the Louisiana Purchase, during the 19th century, St. Louis developed as a major port on the Mississippi River. In the 1870 Census, St. Louis was ranked as the 4th-largest city in the United States and it separated from St. Louis County in 1877, becoming an independent city and limiting its own political boundaries. In 1904, it hosted the Louisiana Purchase Exposition and the Summer Olympics, the economy of metro St. Louis relies on service, trade, transportation of goods, and tourism. This city has become known for its growing medical, pharmaceutical. St. Louis has 2 professional sports teams, the St. Louis Cardinals of Major League Baseball, the city is commonly identified with the 630-foot tall Gateway Arch in Downtown St. Louis. The area that would become St. Louis was a center of the Native American Mississippian culture and their major regional center was at Cahokia Mounds, active from 900 AD to 1500 AD. Due to numerous major earthworks within St. Louis boundaries, the city was nicknamed as the Mound City and these mounds were mostly demolished during the citys development. 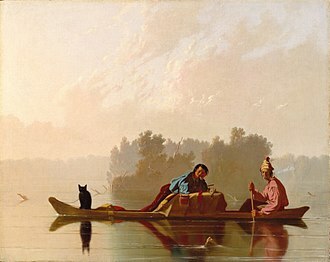 Historic Native American tribes in the area included the Siouan-speaking Osage people, whose territory extended west, European exploration of the area was first recorded in 1673, when French explorers Louis Jolliet and Jacques Marquette traveled through the Mississippi River valley. Five years later, La Salle claimed the region for France as part of La Louisiane. 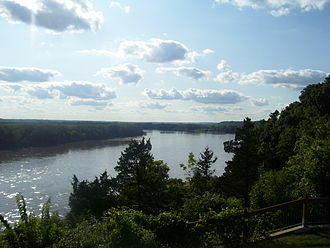 The earliest European settlements in the area were built in Illinois Country on the east side of the Mississippi River during the 1690s and early 1700s at Cahokia, migrants from the French villages on the opposite side of the Mississippi River founded Ste. The primary purpose of ATC worldwide is to prevent collisions and expedite the flow of air traffic, and provide information and other support for pilots. In some countries, ATC plays a security or defensive role, to prevent collisions, ATC enforces traffic separation rules, which ensure each aircraft maintains a minimum amount of empty space around it at all times. Many aircraft have collision avoidance systems, which provide additional safety by warning pilots when other aircraft get too close, in many countries, ATC provides services to all private and commercial aircraft operating within its airspace. Depending on the type of flight and the class of airspace, ATC may issue instructions that pilots are required to obey, or advisories that pilots may, at their discretion, disregard. Pursuant to requirements of the International Civil Aviation Organization, ATC operations are conducted either in the English language or the used by the station on the ground. In practice, the language for a region is normally used, however. In 1921, Croydon Airport, London was the first airport in the world to air traffic control. In the United States, air traffic control developed three divisions, the first of air mail radio stations was created in 1922 after World War I when the U. S. Post Office began using techniques developed by the Army to direct, over time, the AMRS morphed into flight service stations. Todays flight service stations do not issue instructions, but provide pilots with many other flight related informational services. They do relay control instructions from ATC in areas where service is the only facility with radio or phone coverage. The first airport traffic control tower, regulating arrivals and surface movement of aircraft at a specific airport, approach/departure control facilities were created after adoption of radar in the 1950s to monitor and control the busy airspace around larger airports. The first air traffic control center, which directs the movement of aircraft between departure and destination was opened in Newark, NJ in 1935, followed in 1936 by Chicago. Dallas Love Field is a city-owned public airport 6 miles northwest of downtown Dallas, Texas. It was Dallas main airport until 1974 when Dallas/Fort Worth International Airport opened, the corporate headquarters for Southwest Airlines is located at Love Field. The airport is a city for Southwest as well as for Virgin America. Seven full-service fixed-base operators provide general aviation service, maintenance, hangar rentals, some provide meeting rooms, car rentals, limousine service and restaurants. His Wright Model C biplane crashed during practice for his Military Aviator Test, Love Field was named by the United States Army on October 19,1917. The airfield was one of thirty-two new Air Service fields and it was constructed just southeast of Bachman Lake, and it covered over 700 acres and could accommodate up to 1,000 personnel. Dozens of wooden buildings served as headquarters and officers’ quarters, enlisted men had to bivouac in tents. Love Field served as a base for training for the United States Army Air Service. In 1917, flight training occurred in two phases and advanced, primary training took eight weeks and consisted of pilots learning basic flight skills under dual and solo instruction. After completion of their training at Love Field, flight cadets were transferred to another base for advanced training. After officially opening on October 19,1917, the first unit stationed at Love Field was the 136th Aero Squadron, which was transferred from Kelly Field, south of San Antonio, Texas. 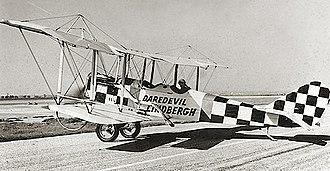 Only a few U. S. Army Air Service aircraft arrived with the 136th Aero Squadron and it was assigned to the Aviation Repair Depot, Dallas Texas in April 1918. It was demobilized in March 1919, with the sudden end of World War I in November 1918, the future operational status of Love Field was unknown. Many local officials speculated that the U. S. government would keep the open because of the outstanding combat record established by Love-trained pilots in Europe. Locals pointed to the weather conditions in the Dallas area for flight training. They made the first controlled, sustained flight of a powered, heavier-than-air aircraft on December 17,1903, four miles south of Kitty Hawk, North Carolina. In 1904–05 the brothers developed their flying machine into the first practical fixed-wing aircraft, although not the first to build and fly experimental aircraft, the Wright brothers were the first to invent aircraft controls that made fixed-wing powered flight possible. The brothers fundamental breakthrough was their invention of three-axis control, which enabled the pilot to steer the aircraft effectively and this method became and remains standard on fixed-wing aircraft of all kinds. From the beginning of their work, the Wright brothers focused on developing a reliable method of pilot control as the key to solving the flying problem. 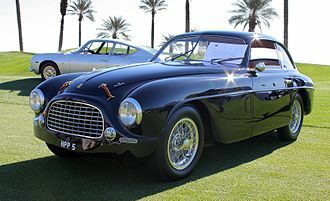 This approach differed significantly from other experimenters of the time who put emphasis on developing powerful engines. Using a small wind tunnel, the Wrights collected more accurate data than any before, enabling them to design and build wings. Their first U. S. patent,821,393, did not claim invention of a machine, but rather. They gained the skills essential for their success by working for years in their shop with printing presses, motors. 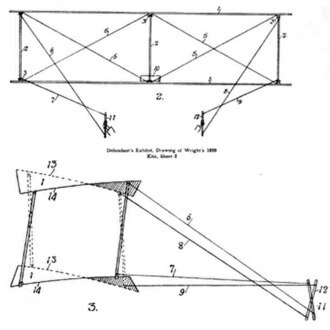 Their work with bicycles in particular influenced their belief that a vehicle like a flying machine could be controlled and balanced with practice. From 1900 until their first powered flights in late 1903, they conducted extensive tests that developed their skills as pilots. Their bicycle shop employee Charlie Taylor became an important part of the team, the Wright brothers status as inventors of the airplane has been subject to counter-claims by various parties. Much controversy persists over the competing claims of early aviators. The Wright brothers were two of seven born to Milton Wright, of English and Dutch ancestry, and Susan Catherine Koerner, of German. Wilbur was born near Millville, Indiana, in 1867, Orville in Dayton, the other Wright siblings were Reuchlin, Lorin and twins Otis and Ida. 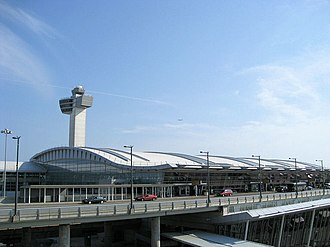 John F. Kennedy International Airport is a major international airport located near South Ozone Park in the borough of Queens in New York City, United States,12 miles southeast of Lower Manhattan. Over ninety airlines operate out of the airport, with non-stop or direct flights to destinations in all six inhabited continents, the airport features six passenger terminals and four runways. It serves as a hub for American Airlines and Delta Air Lines and is the operating base for JetBlue Airways. In the past, JFK served as a hub for Eastern, Pan Am, John F. Kennedy International Airport was originally Idlewild Airport after the Idlewild Beach Golf Course that it displaced. It was built to relieve LaGuardia Airport, which was overcrowded soon after opening in 1939. Construction began in 1943, and about $60 million was spent of governmental funding. In March 1948 the New York City Council changed the name to New York International Airport, Anderson Field, the Port Authority leased the JFK property from the City of New York in 1947 and maintains this lease today. 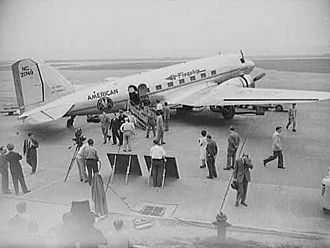 The first airline flight from JFK was on July 1,1948, the Port Authority cancelled foreign airlines permits to use LaGuardia, forcing them to move to JFK during the next couple of years. JFK opened with six runways and a seventh under construction, runways 1L and 7L were held in reserve and never came into use as runways. Runway 31R is still in use, runway 31L opened soon after the rest of the airport and is still in use, runway 1R closed in 1957, runway 4 opened June 1949 and runway 4R was added ten years later. A smaller runway 14/32 was built after runway 7R closed and was used through 1990 by general aviation, STOL and smaller commuter flights. The Avro Jetliner was the first jetliner to land at JFK on April 18,1950, in 1957 the USSR sought approval for two Tupolev Tu-104 flights carrying diplomats to JFK, the Port Authority did not allow them, saying noise tests had to be done first. The airport was renamed John F. Kennedy International Airport on December 24,1963, then-mayor Robert F.
Greater St. Louis is the metropolitan area that completely surrounds and includes the independent city of St. Louis. 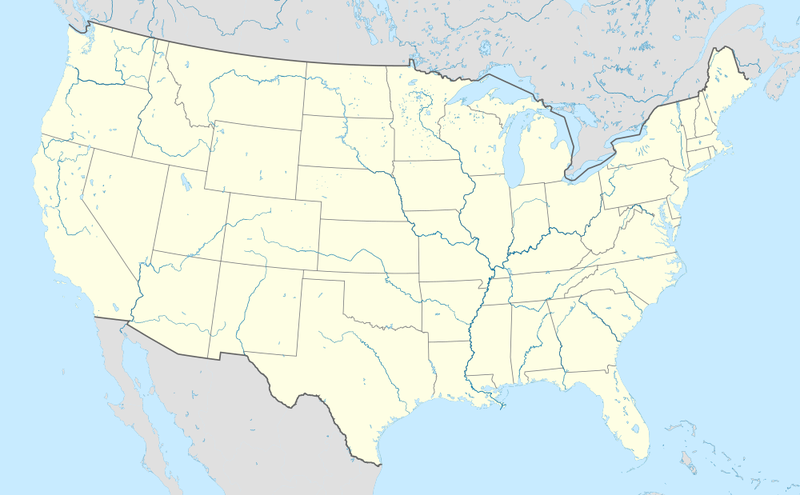 It includes parts of both the U. S. states of Missouri and Illinois, the city core is on the border to Illinois and collectively the two regions form the combined metropolitan area. St. Louis is the largest metro area in Missouri, and is the second largest in Illinois, St. Louis County is independent of the city of St. Louis and their two populations are generally tabulated separately. 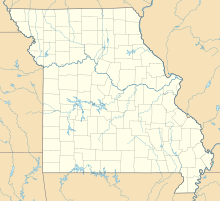 Depending on the counties included in the area, it can refer to the St. Louis, MO-IL metropolitan statistical area or the St. Louis-St. Charles-Farmington, MO-IL combined statistical area. The CSA includes all of the MSA listed above and the Farmington, MO micropolitan statistical area, which includes Washington and St. Francois Counties. The CSA was the 19th largest in the United States in 2015, with a population of 2,916,447, while the MSA was the 20th largest in the country that year with a population of 2,811,588. The region is home to nine Fortune 500 companies, Express Scripts, Emerson Electric, Reinsurance Group of America, Peabody Energy, Graybar Electric, the area received the All-America City Award in 2008. The nearby Hannibal–Quincy micropolitan areas are not located within the metropolitan. According to the 2010 United States Census, in Greater St. Louis there were 2,787,701 people living in 1,143,001 households, of which 748,892 households were families. In 2010,98.2 percent of Greater St. Louis was of one race,72,797 residents or 2.5 percent were Hispanic or Latino Americans of any race. As of 2010, the age for Greater St. Louis is 38.2. As of 2010, Greater St. Louis included 1,264,680 housing units,3.3 percent or 41,884 units were vacant and not for sale or rent. Of the occupied housing units,70.6 percent or 807,431 were owner-occupied with 2,075,622 occupants,29.4 percent or 335,570 units were rented with 739,749 occupants. In 2010, the income for a household in the St. Louis metro was $50,900. Transportation in Greater St. 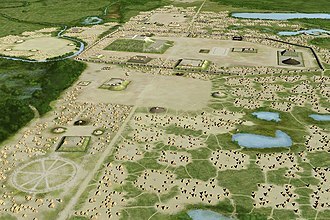 Artist's conception of the Mississippian culture Cahokia Mounds Site in Illinois, directly across the Mississippi River from modern St. Louis. The home of Auguste Chouteau in St. Louis. Chouteau and Pierre Laclède founded St. Louis in 1764. 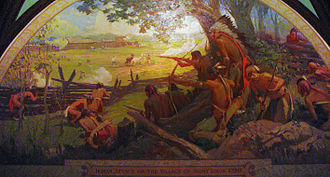 In 1780 during the American Revolutionary War, St. Louis was attacked by British forces, mostly Native American allies, in the Battle of St. Louis. 4 Cape Air Cessna 402's at Logan International Airport. A Southwest 737-700 departing Phoenix Sky Harbor International Airport. Southwest operates using a unique boarding process. At its heyday, TWA operated a fleet of 747-100 aircraft. This particular aircraft later exploded in midair as TWA Flight 800. American Airlines aircraft at Phoenix Sky Harbor International Airport. American Airlines Boeing 777-300ER in the new livery landing at London Heathrow Airport in 2013. A MetroLink train leaving Union Station. The 1874-built Eads Bridge carries both MetroLink tracks across the Mississippi River between Missouri and Illinois on its lower rail deck, under the road. Brand-new Siemens SD-400 unit on the then-newly opened MetroLink system in 1993. A view of a Red Line train passing through Belleville, Illinois. Potomac Consolidated TRACON in Warrenton, Virginia, United States. The training department at the Washington Air Route Traffic Control Center, Leesburg, Virginia, United States. Terminal 4 replaced the former International Arrivals Building in May 2001. Wright brothers' home at 7 Hawthorn Street, Dayton about 1900. Wilbur and Orville built the covered wrap-around porch in the 1890s. 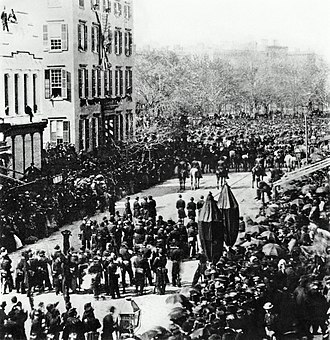 Theodore and Elliot Roosevelt watch Abraham Lincoln's funeral procession passing their grandfather's mansion in New York City. Charles Lindbergh's last pay check as an RAC Air Mail pilot. A Robertson DH-4 used on the CAM-2 Air Mail route. Air France aircraft on stands at Terminal 2F at Charles de Gaulle Airport. A NASA image of the Greater St. Louis area. Hoxsey and Teddy Roosevelt before their flight. October 11, 1910. Glass bottle with paper label. The screw top indicates that the bottle was manufactured post-1920s. The fence outside of Turner Field over which Hank Aaron hit his 715th career home run still exists. Hank Aaron during his August 5, 1978 visit to the White House. The plain of Marathon today, with pine forest and wetlands.